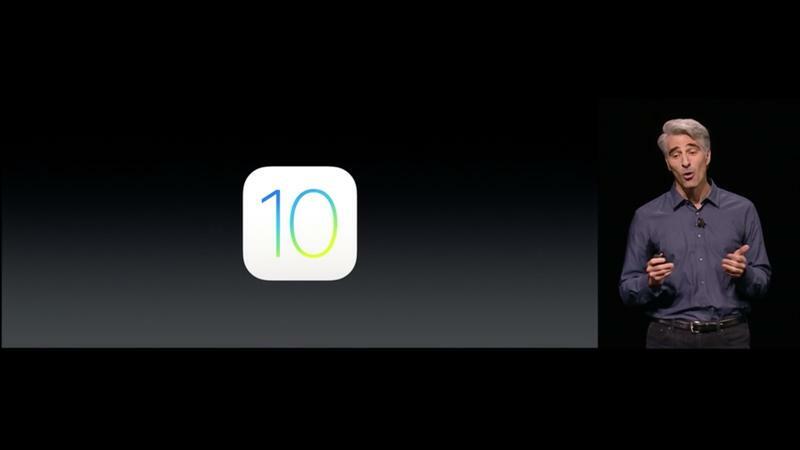 It’s been a long time since Apple introduced a game-changing feature to iOS, but that’s changing with iOS 10. 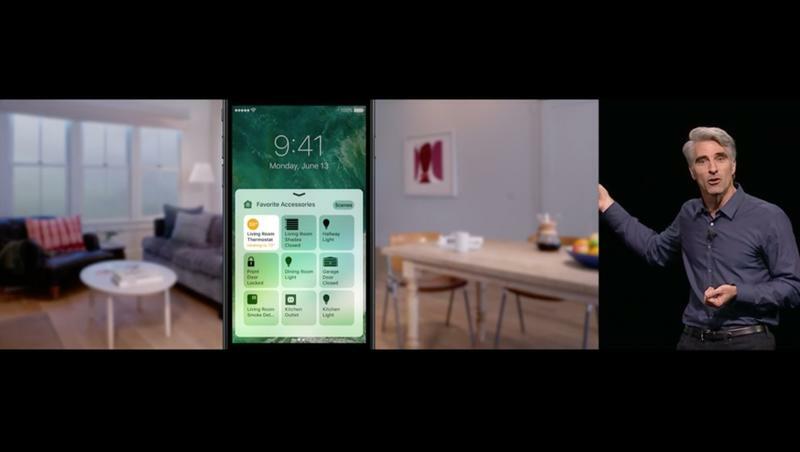 The Cupertino company on Monday officially introduced the newest version of its mobile software, which includes a number of major updates. 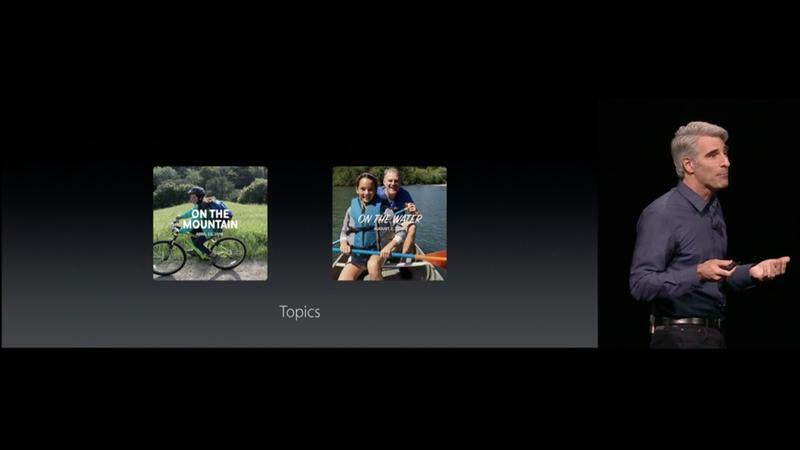 Apple highlighted 10 major features, so we’ll discuss a few…and I’ve highlighted them to make it easy to follow along. 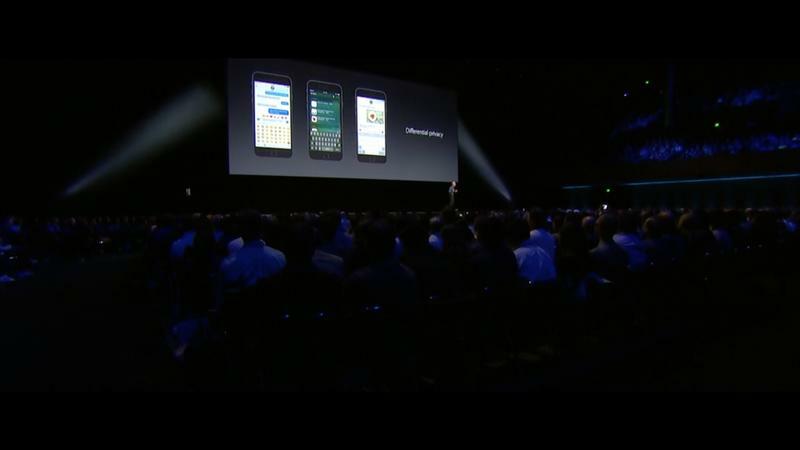 One is “Raise to Wake,” which has been available on plenty of other mobile operating systems. 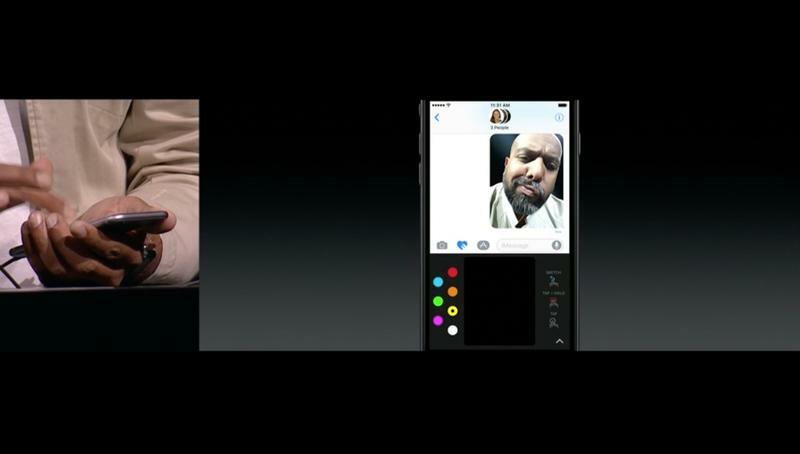 Just lift your phone and it wakes up. 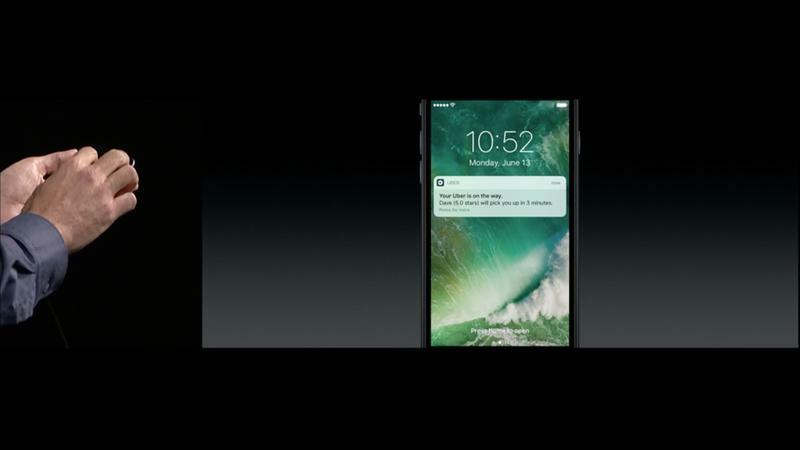 The lock screen now provides more information with live updates from applications, which means notifications are much better. 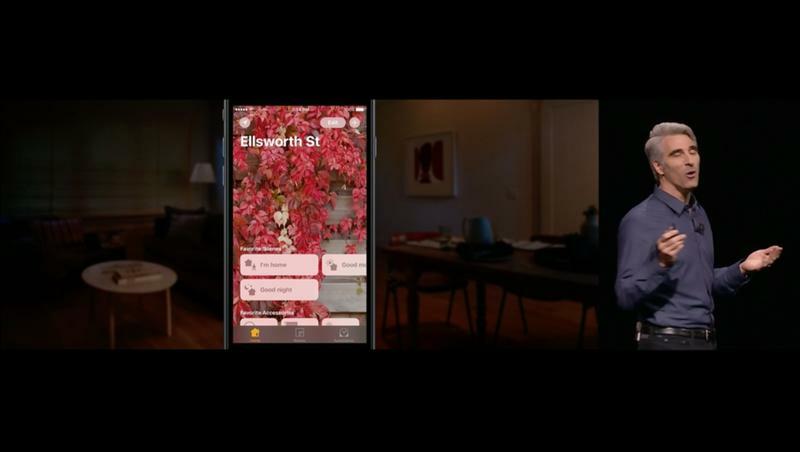 The lock screen also makes it easier to access the camera with a single tap, and your widgets, which are now stored to the left (just a quick slide away). 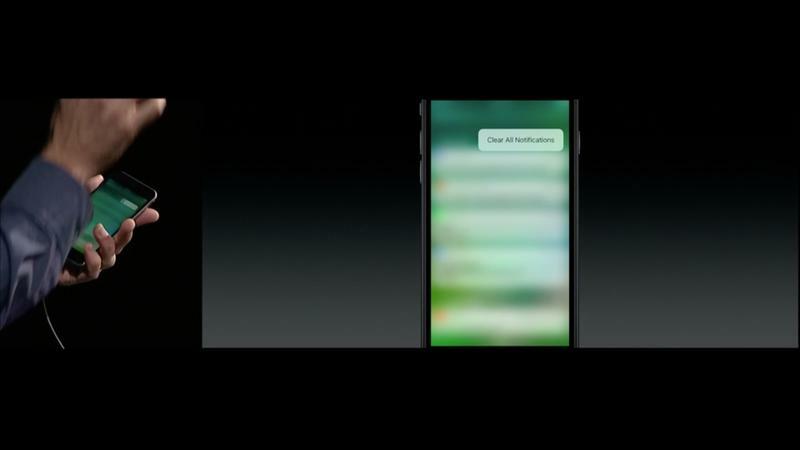 Tap on a widget and you’l see more. 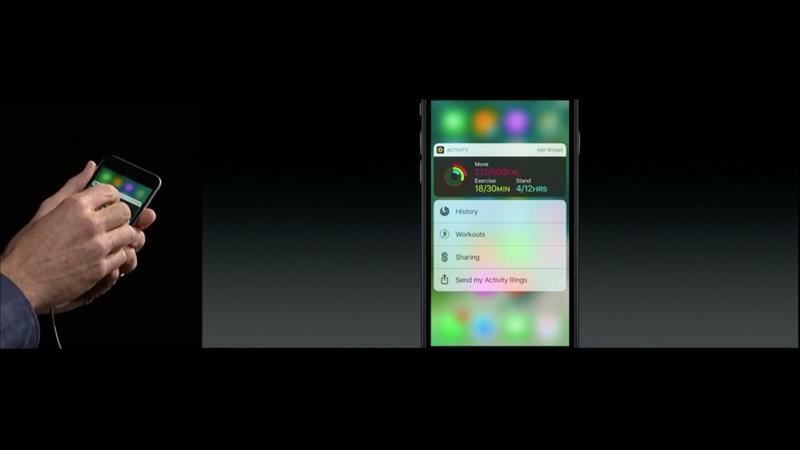 Speaking of widgets, you can actually 3D Touch an application (including third party apps) and you’ll see a widget that provides more information from inside that app. 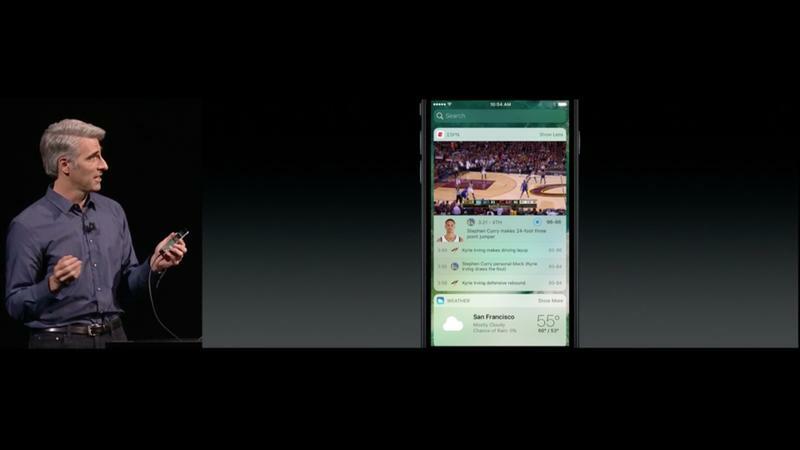 This can be stored on the Today screen, too, complete with widgets with “Live Action” like video highlights from a basketball game in ESPN. 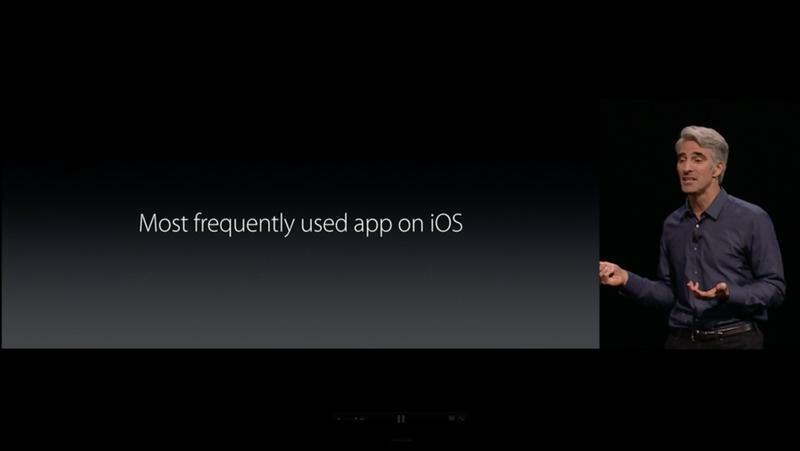 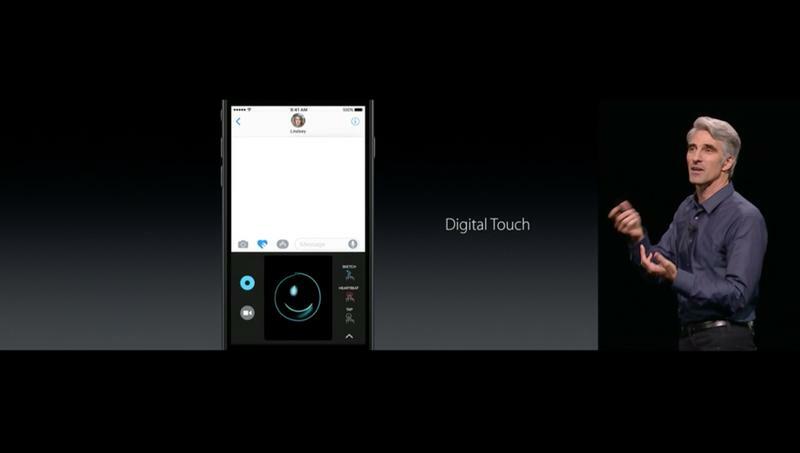 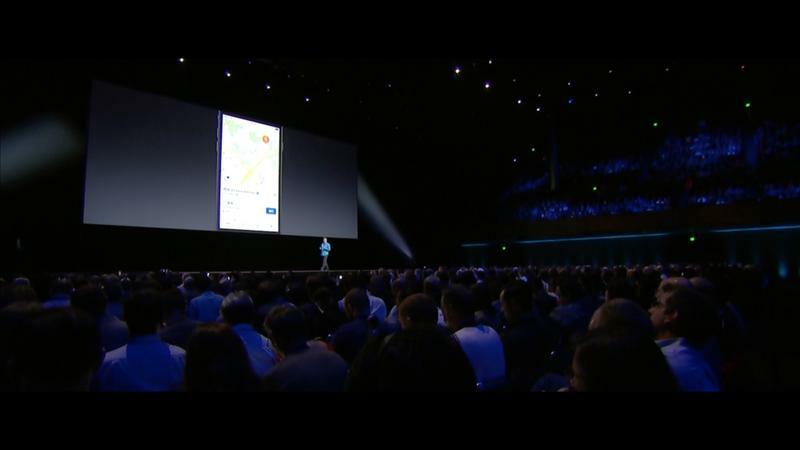 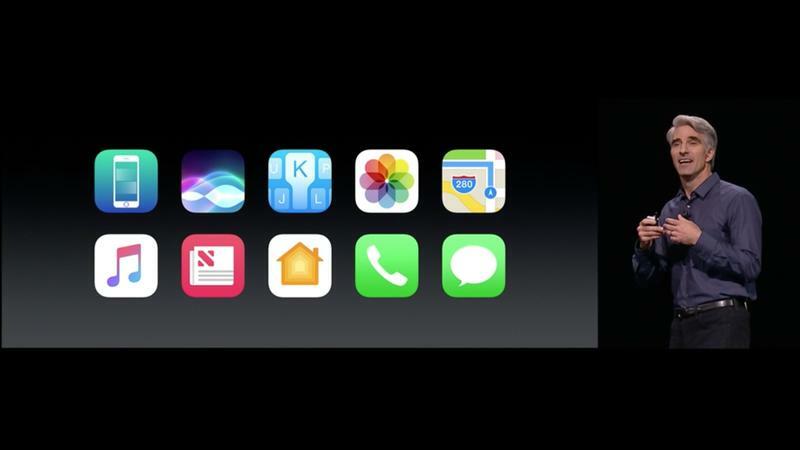 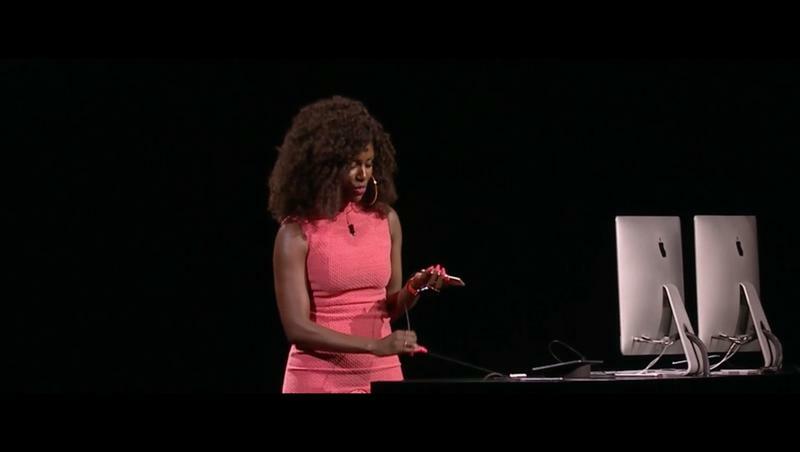 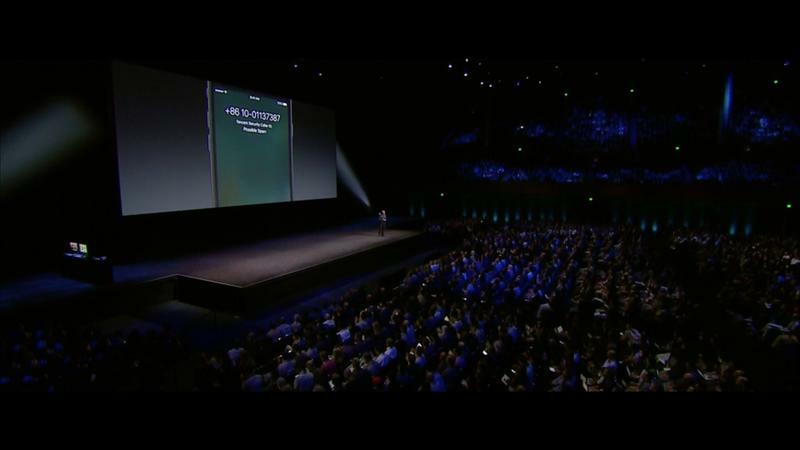 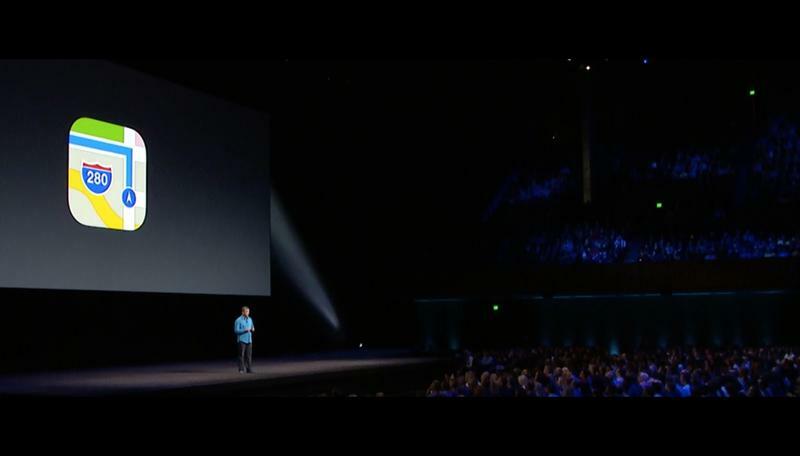 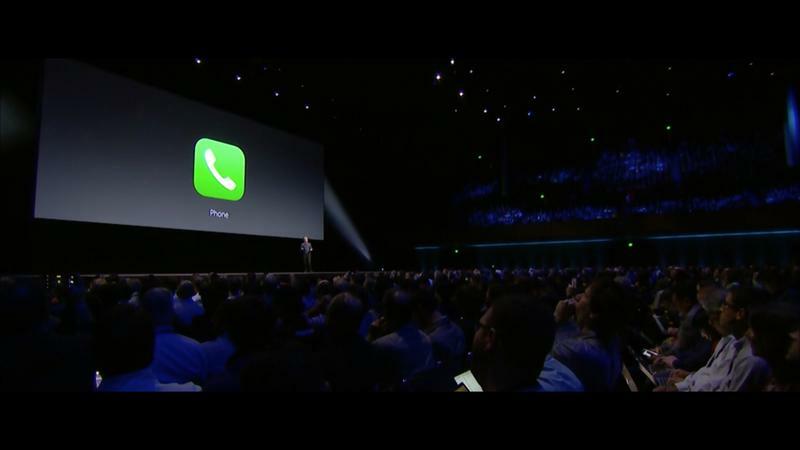 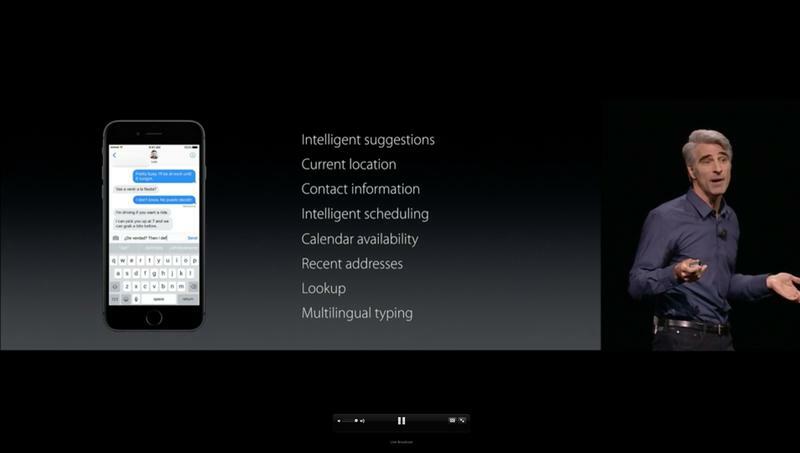 Siri is now open to developers, too, which means she can be access by third party applications. 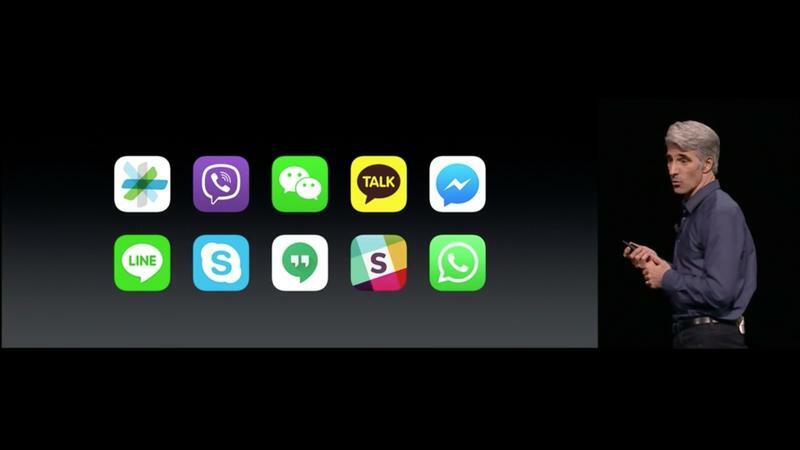 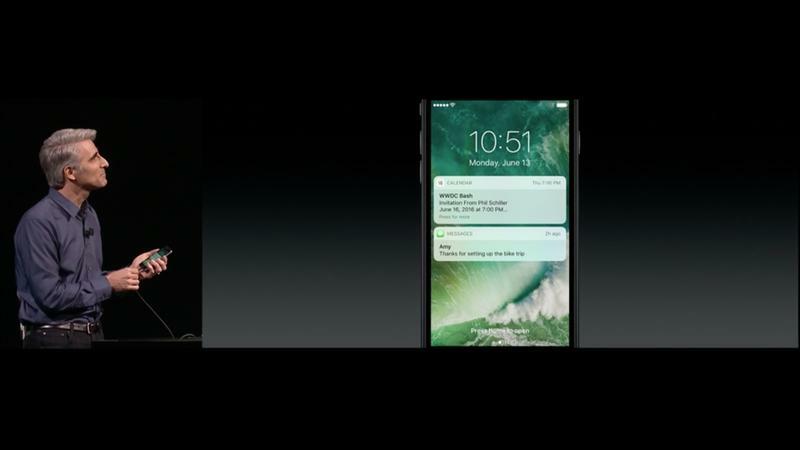 “Send a WeChat to Nancy saying I’ll be 5 minutes late,” Apple provided as an example, showing Siri’s ability to tap into WeChat. 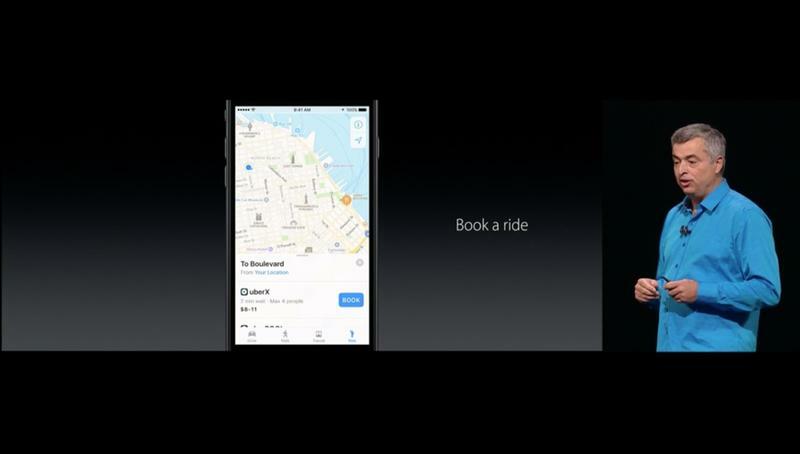 Apple provided several other example, like support for photo search, booking a car in Uber or sending a message in Slack. 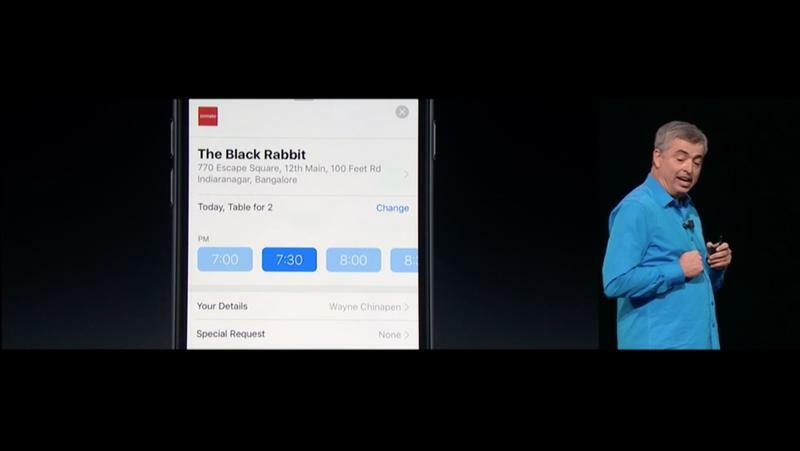 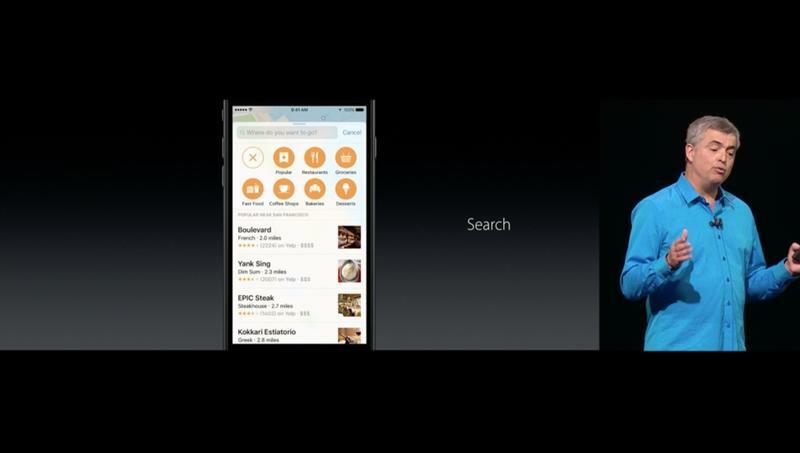 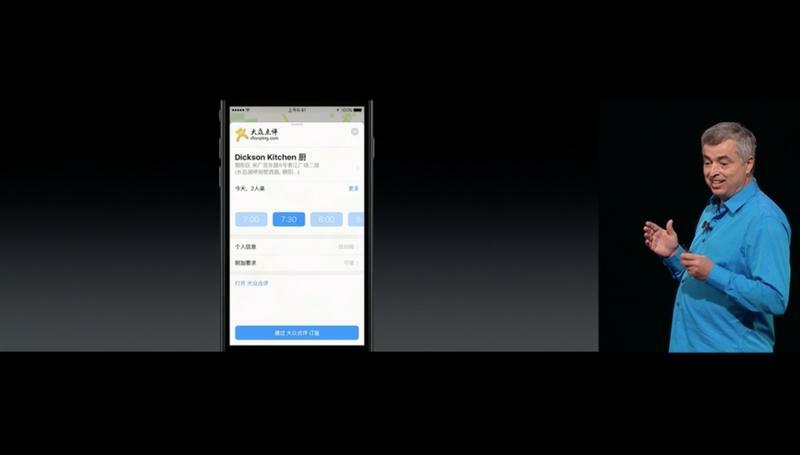 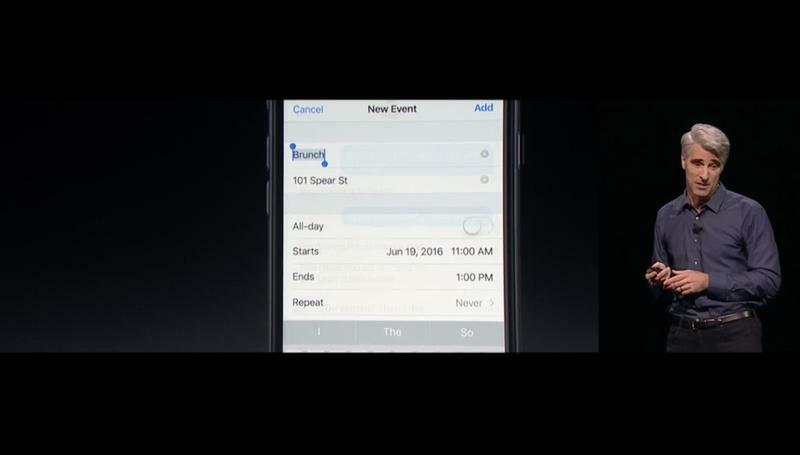 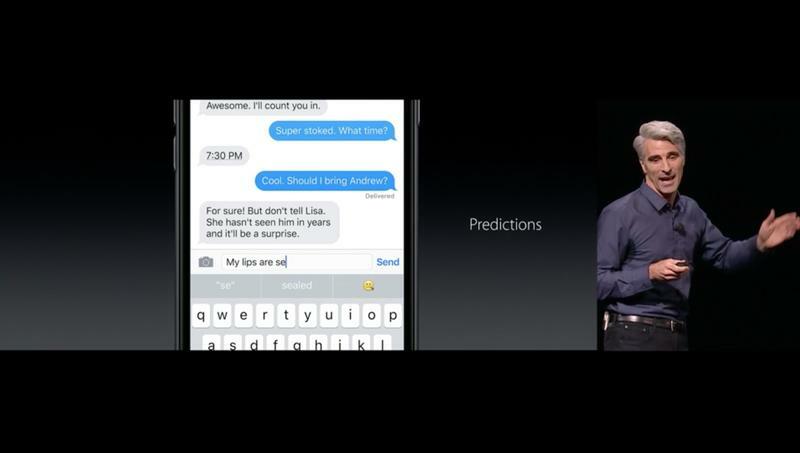 Additionally, Siri will use “deep learning” so she provides more relevant information to you. 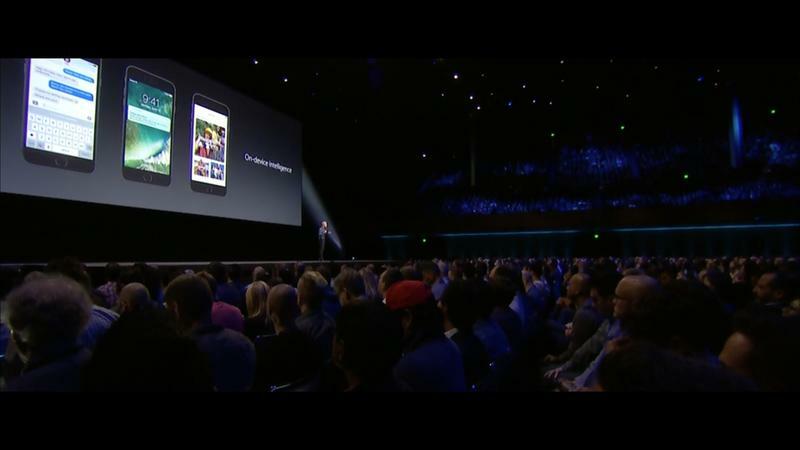 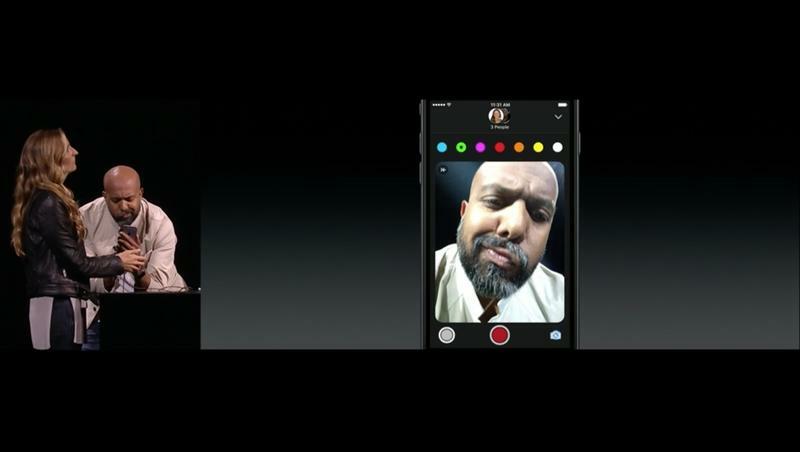 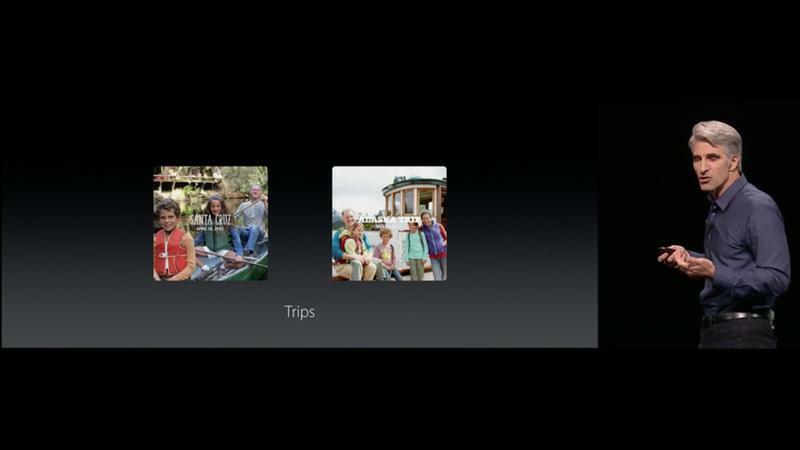 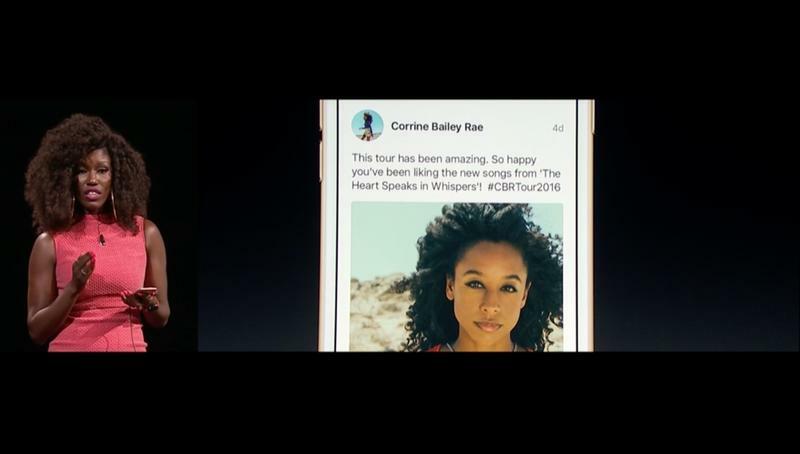 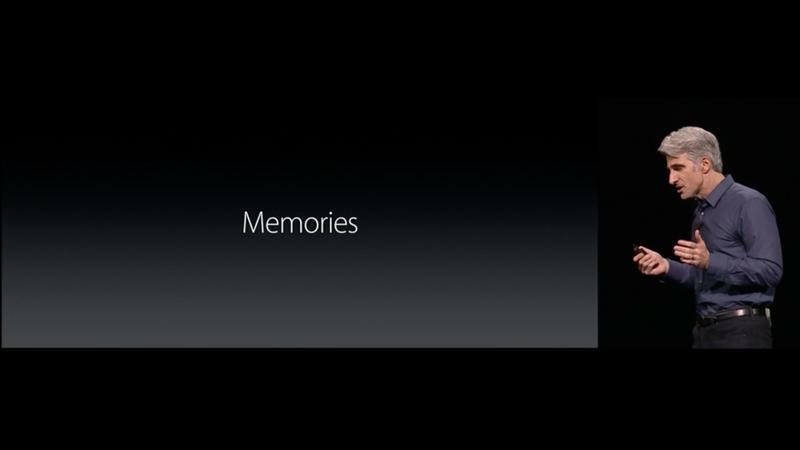 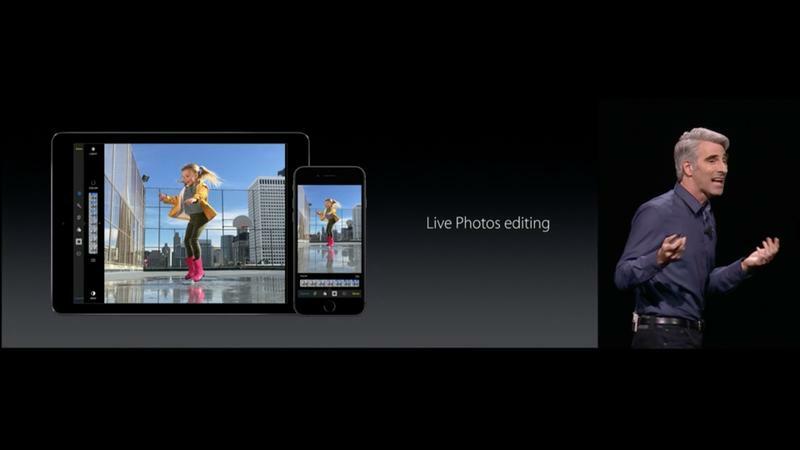 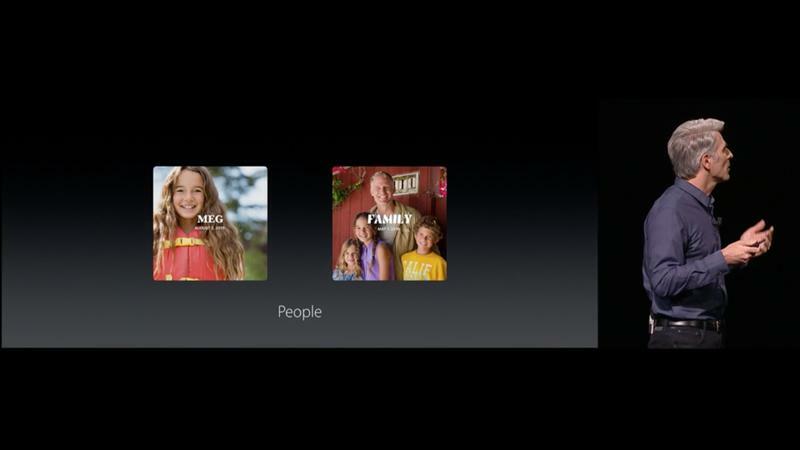 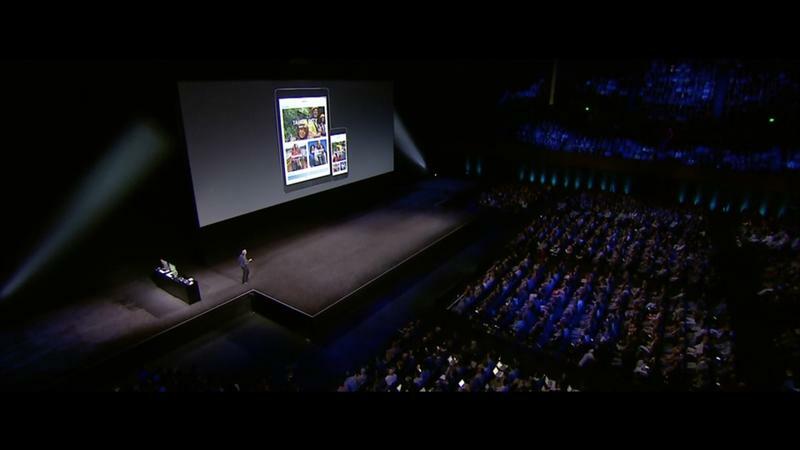 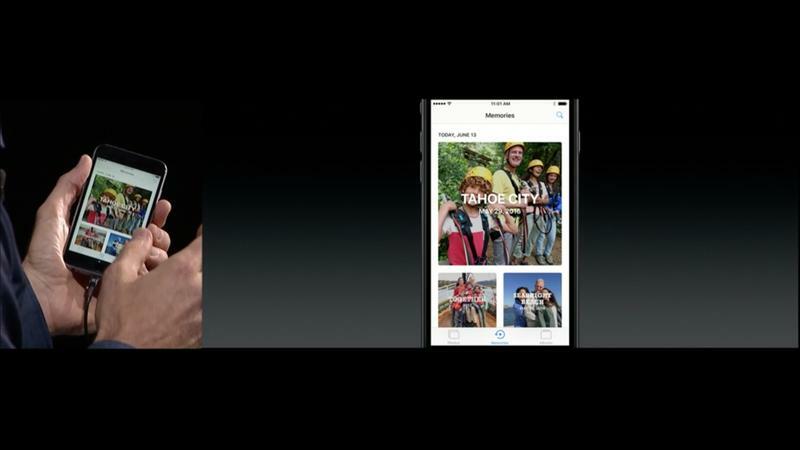 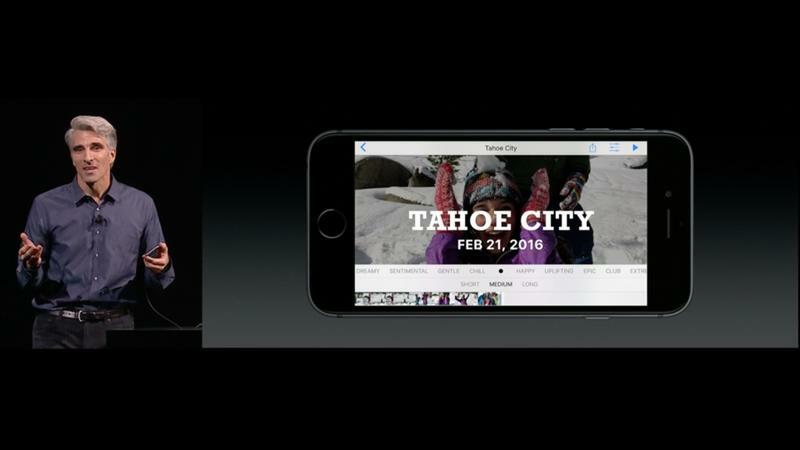 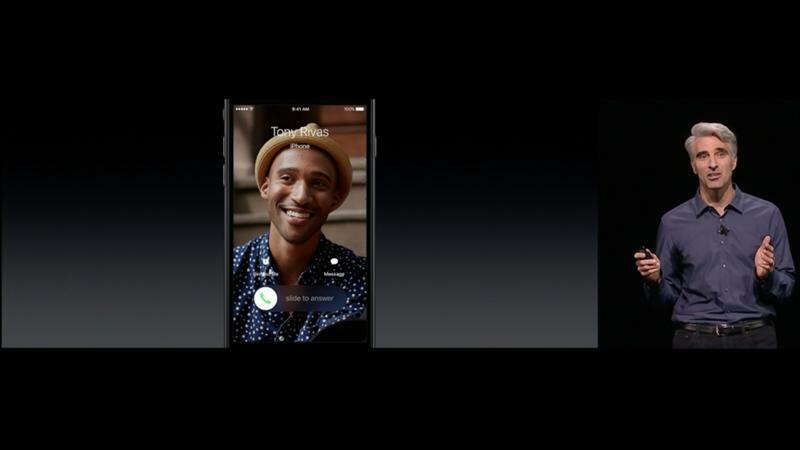 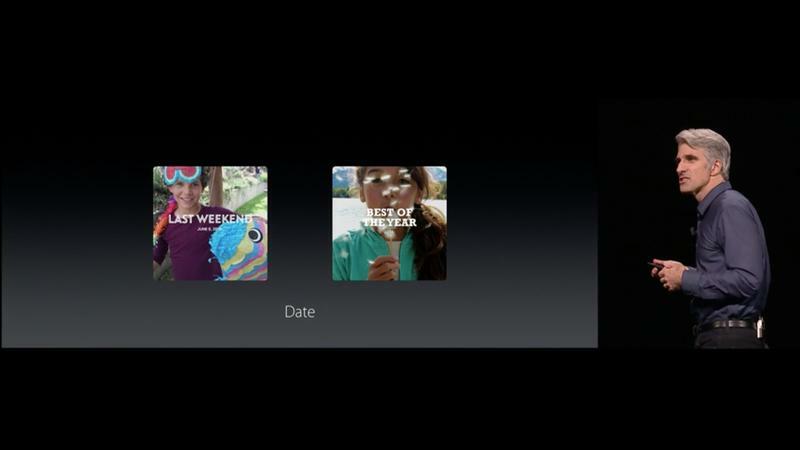 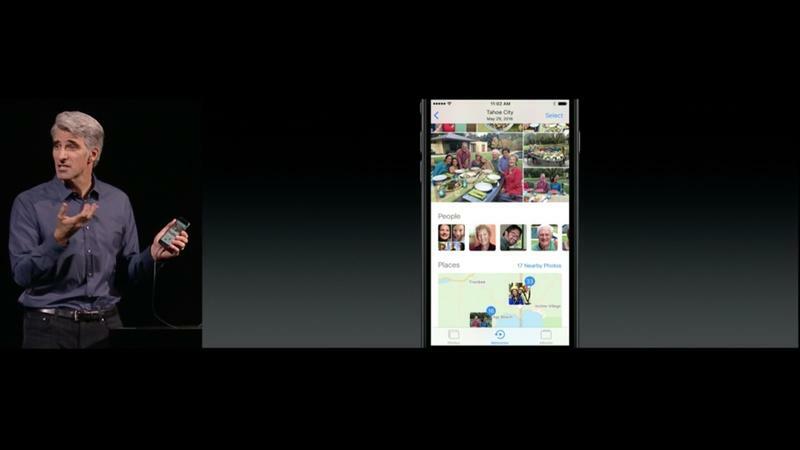 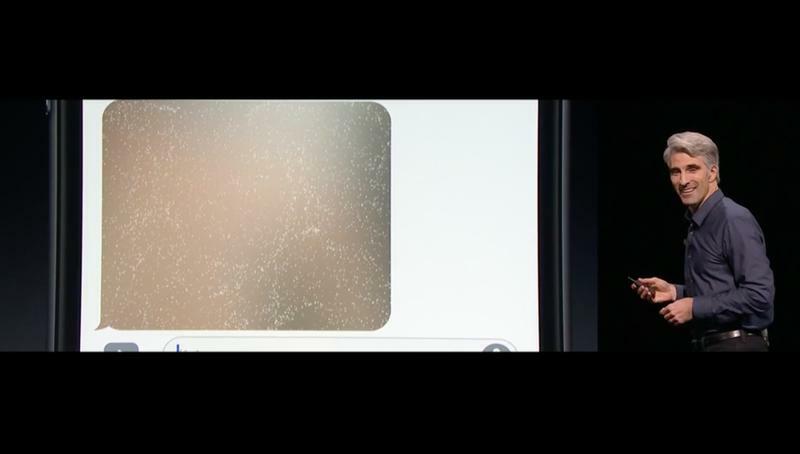 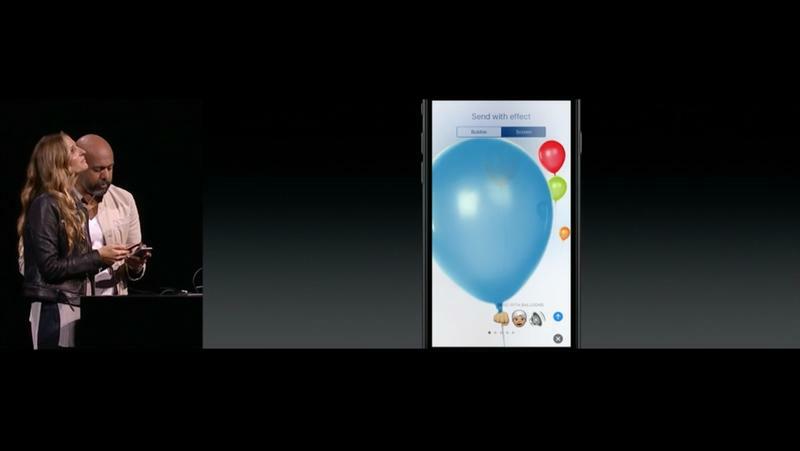 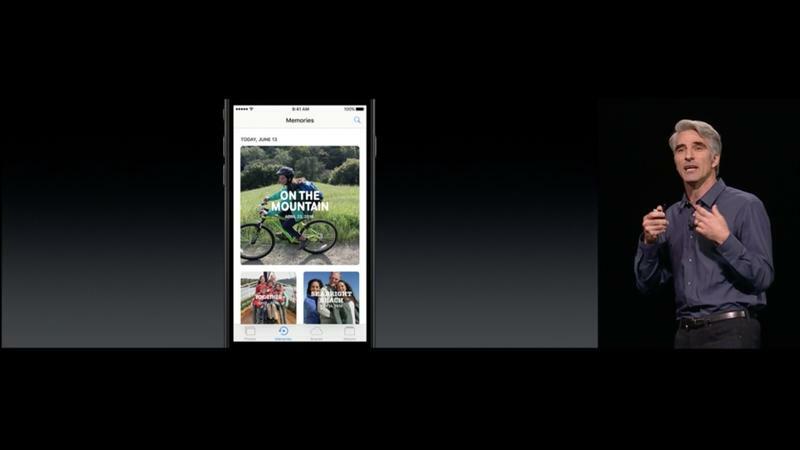 In Photos, Apple is adding “face recognition” so it can sort people into albums. 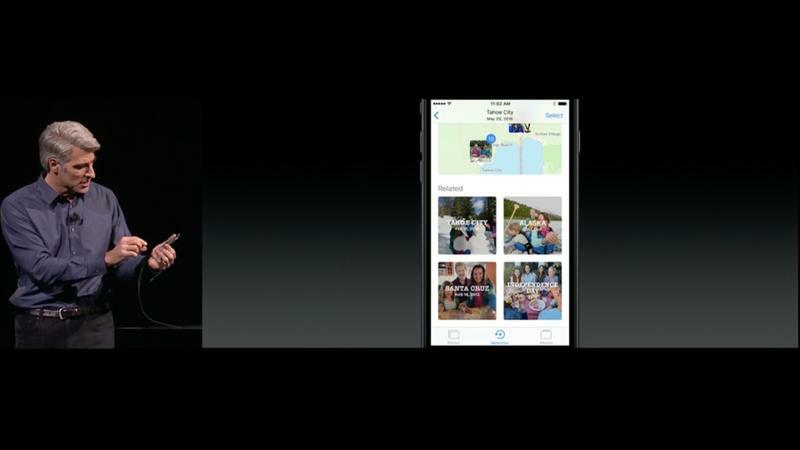 It said this is all done “with your privacy protected.” This recognition will also expand to search all images so you can search for specific scenes (similar to what Google does with Google Photos.) 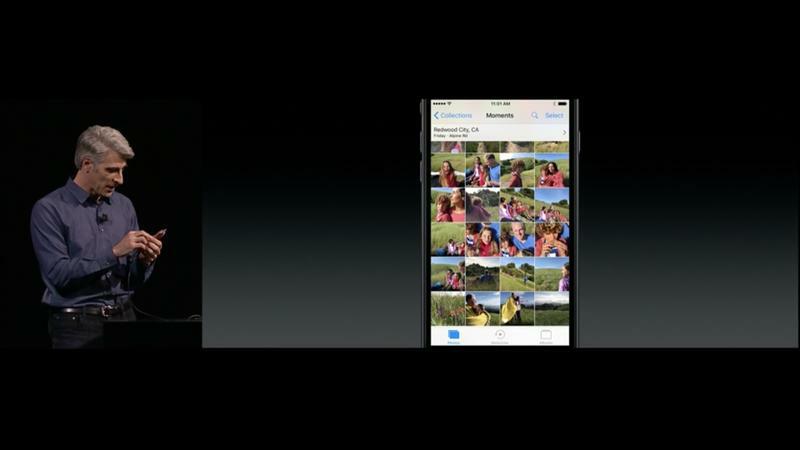 This will also cluster photos based on scenes, location, people, trips and more. 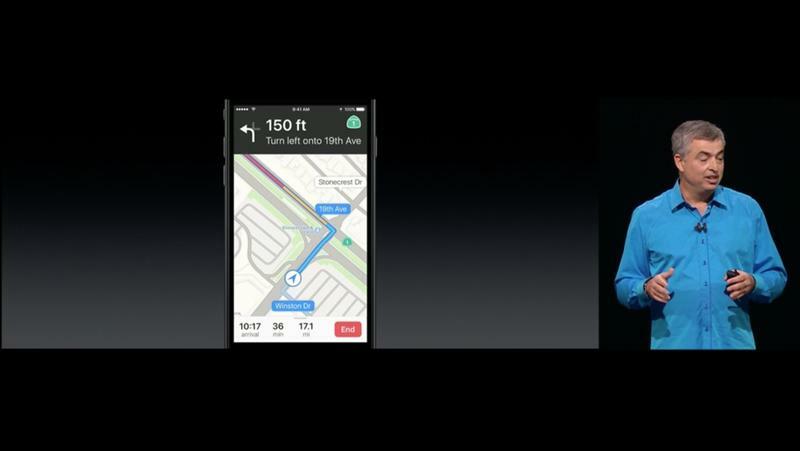 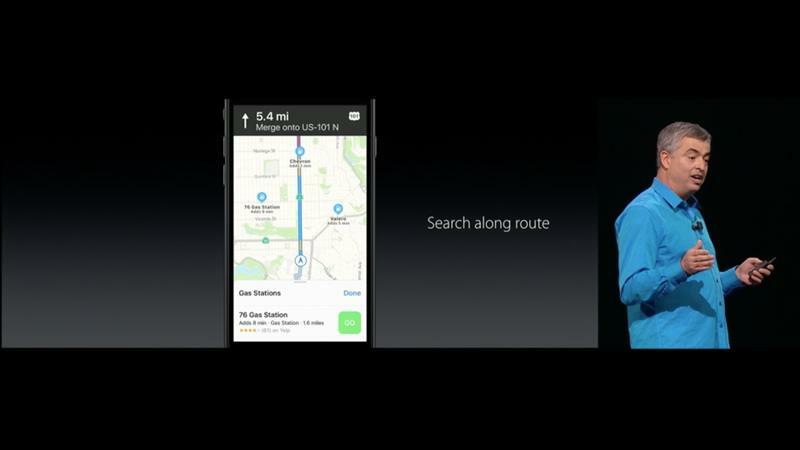 With Maps, Apple is building on its “nearby” updates that it offered last year with transit. 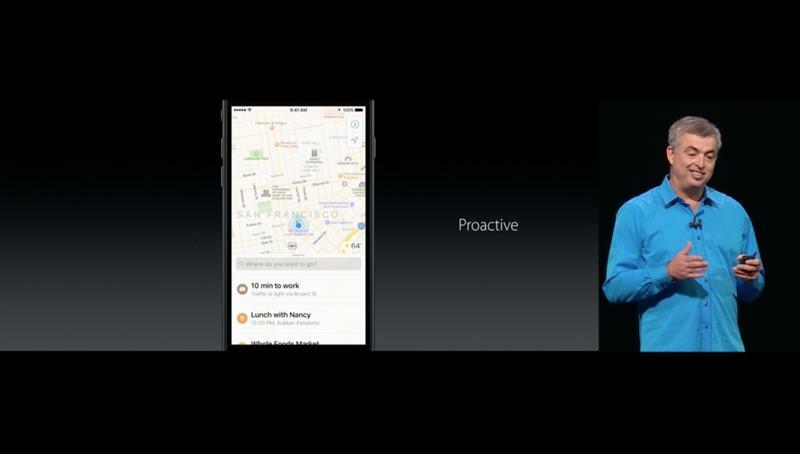 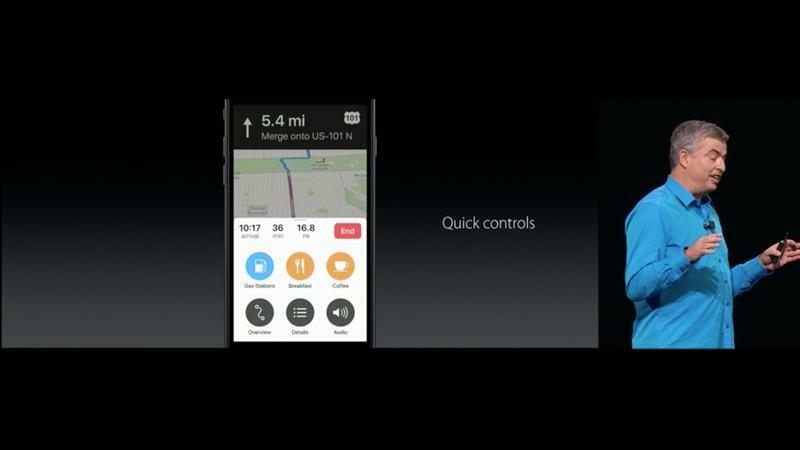 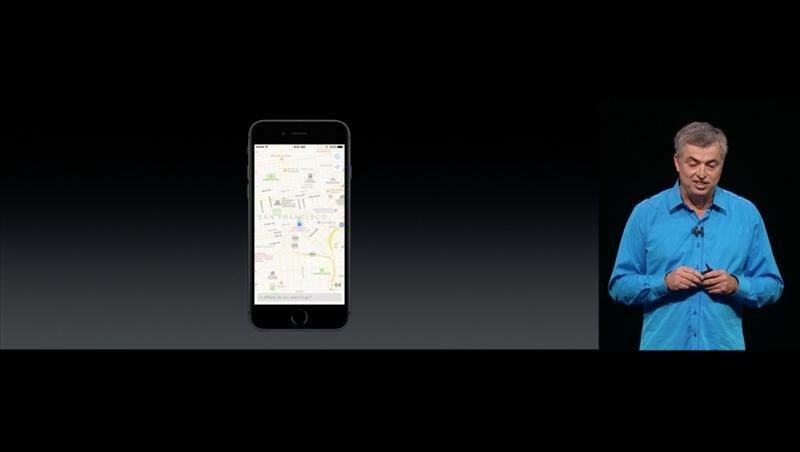 In iOS 10, Maps gets a completely new redesign with “controls and details on locations.” Apple said it’s more proactive, too, with suggestions if you slide up from the bottom of the app. 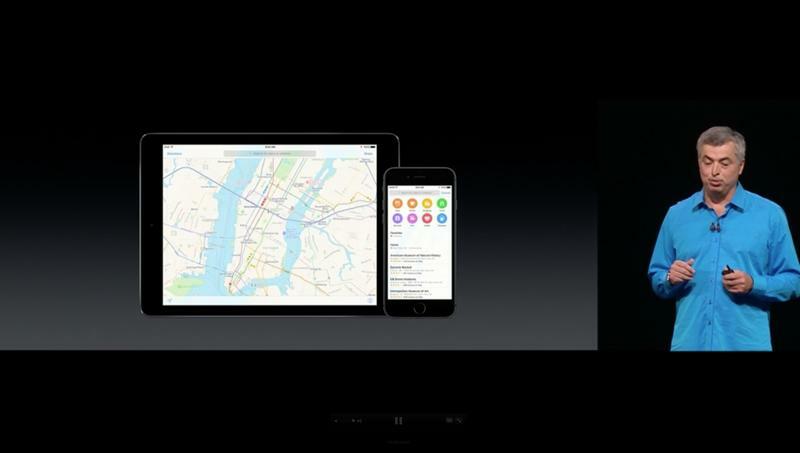 You’ll see data on how far you’re from work, for example, or will provide you with recommendations for places you might want to go. 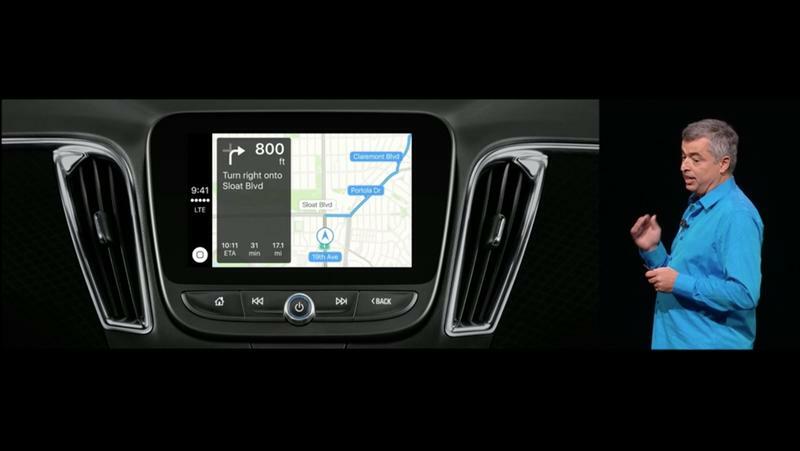 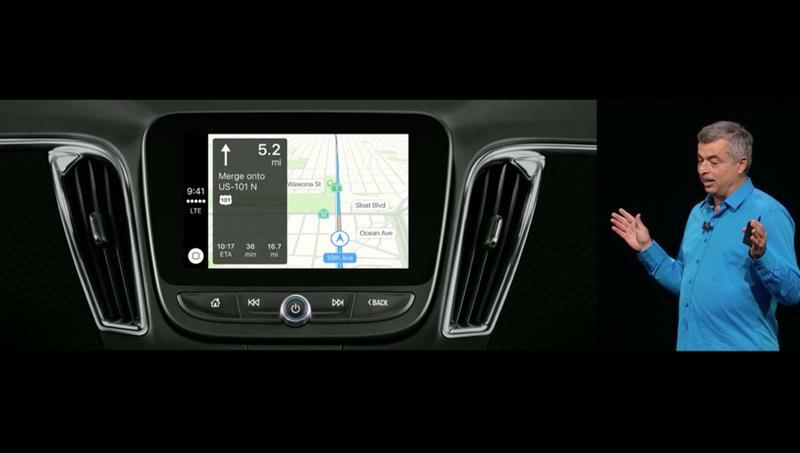 Navigation is getting a redesign, too, with new features for traffic on route, details on your route — including points of interest like food and gas stations — and plenty of other features already available in Google Maps. 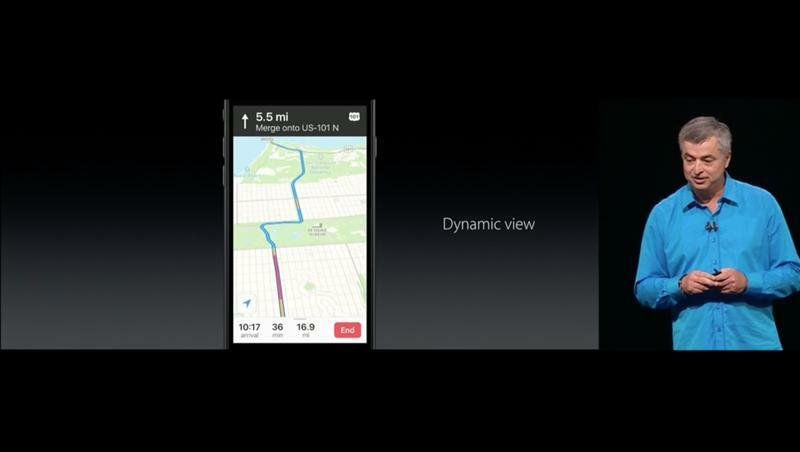 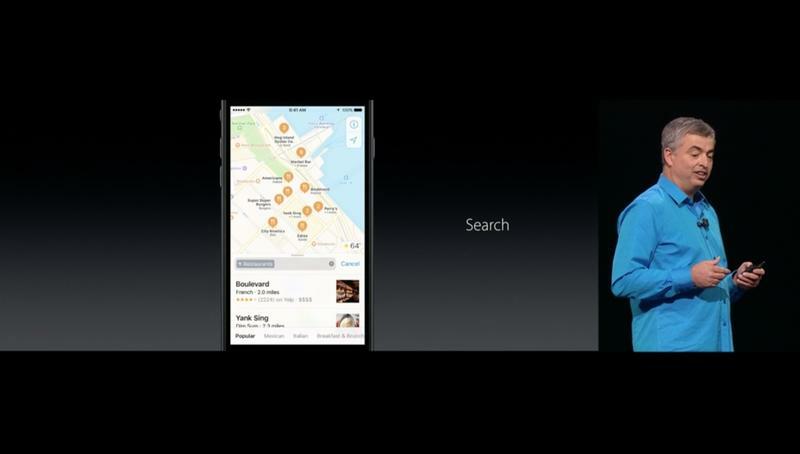 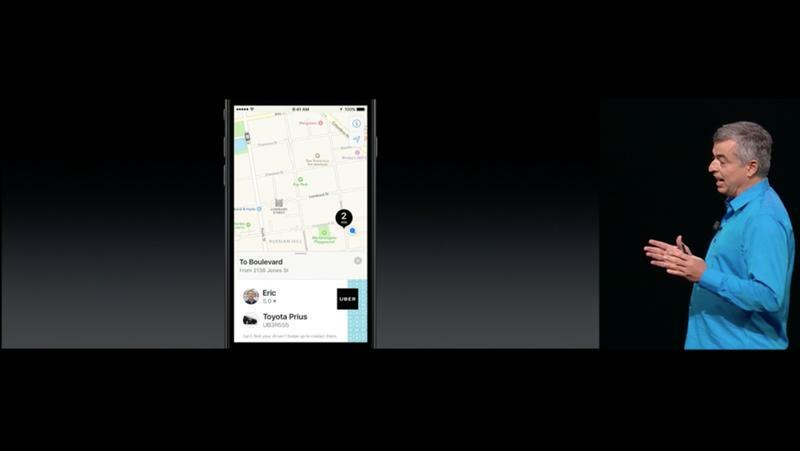 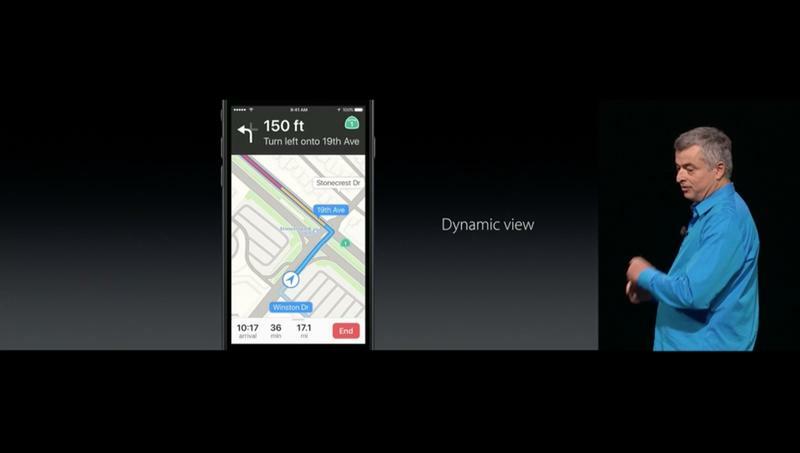 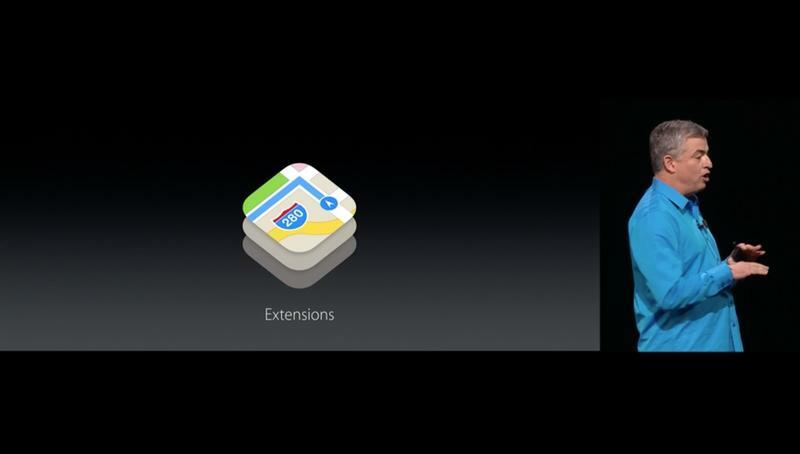 What’s even cooler, though, is Apple is opening up Google Maps to third party developers who can help build it. 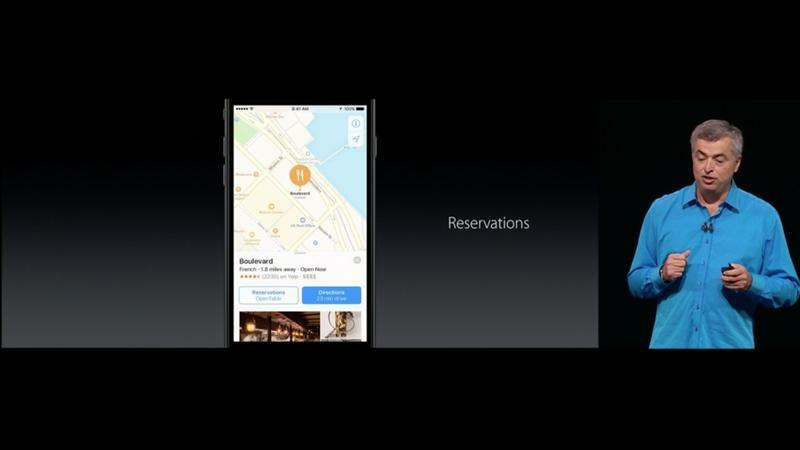 You can book a ride with Uber, for example, or make a reservation using OpenTable. 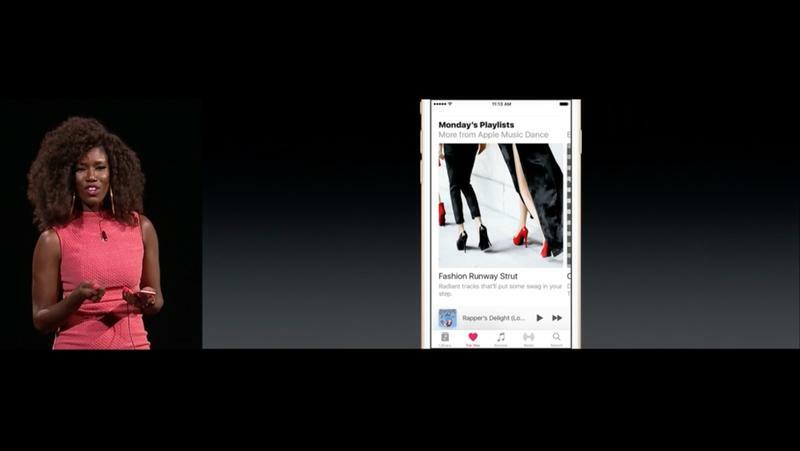 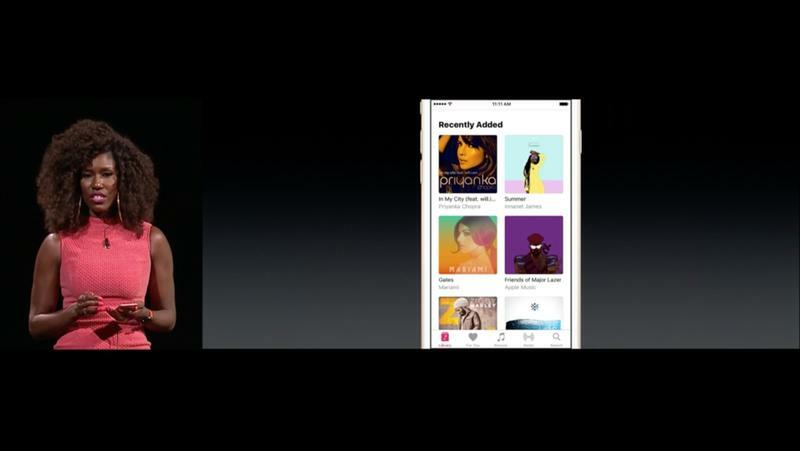 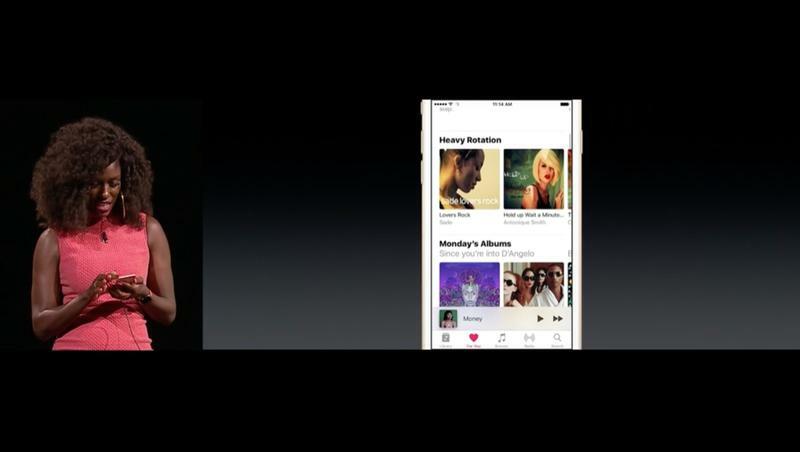 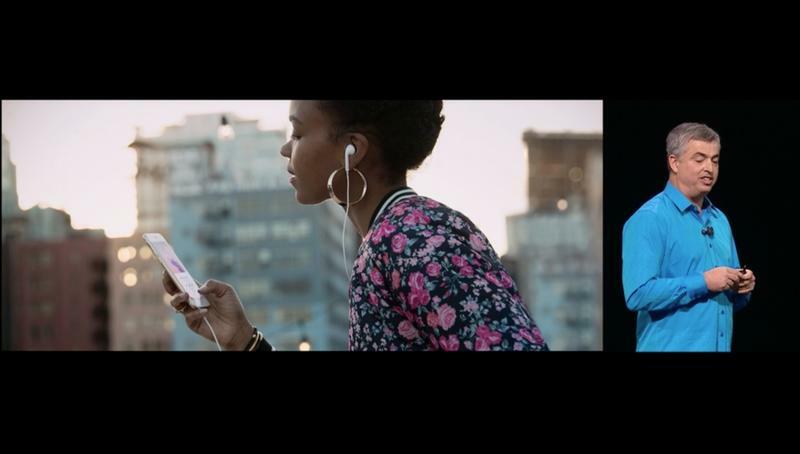 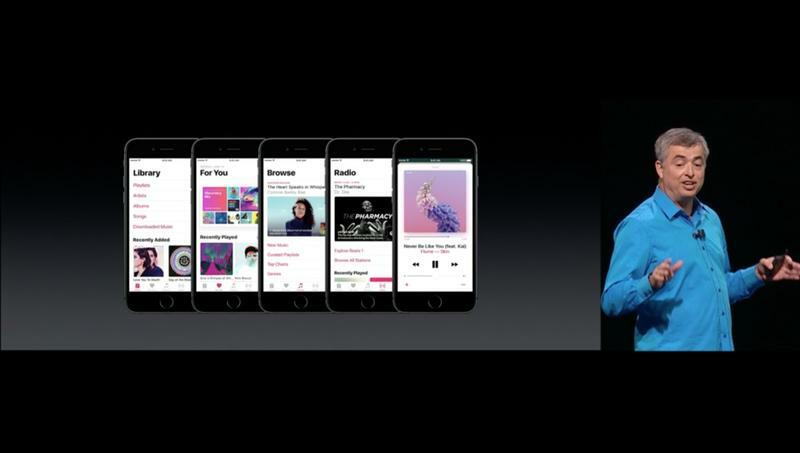 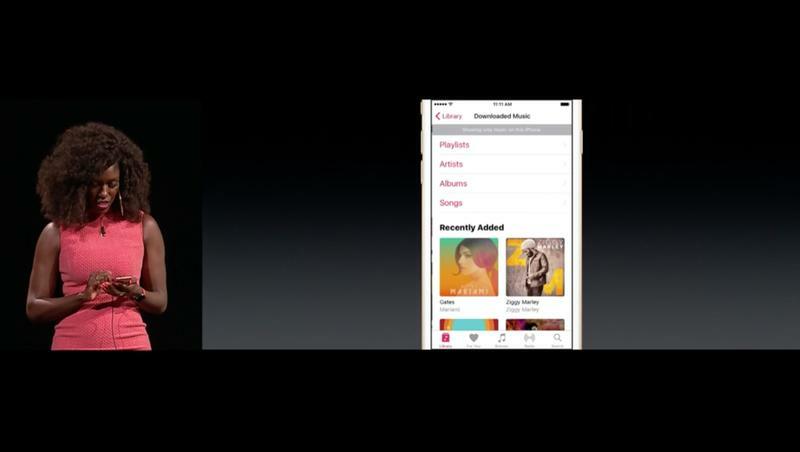 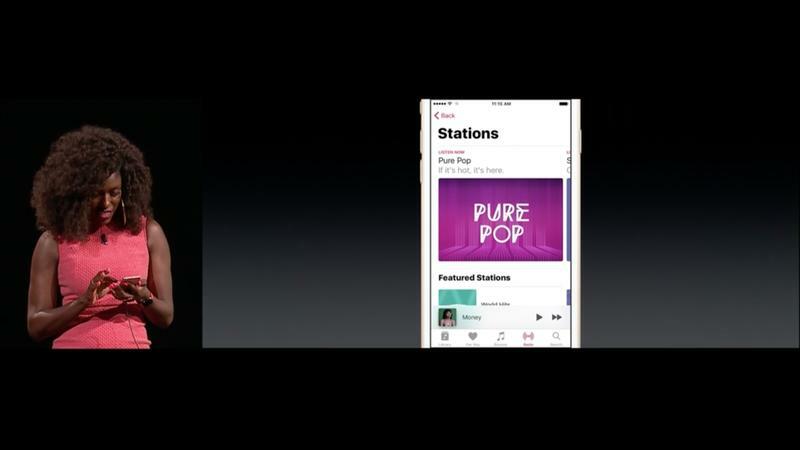 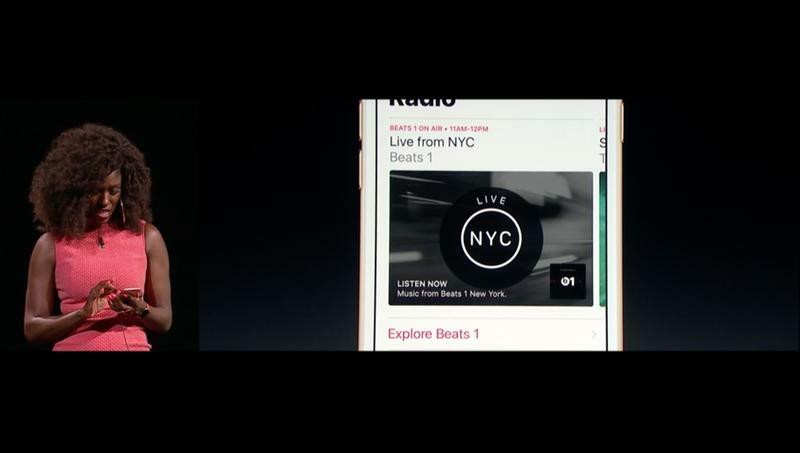 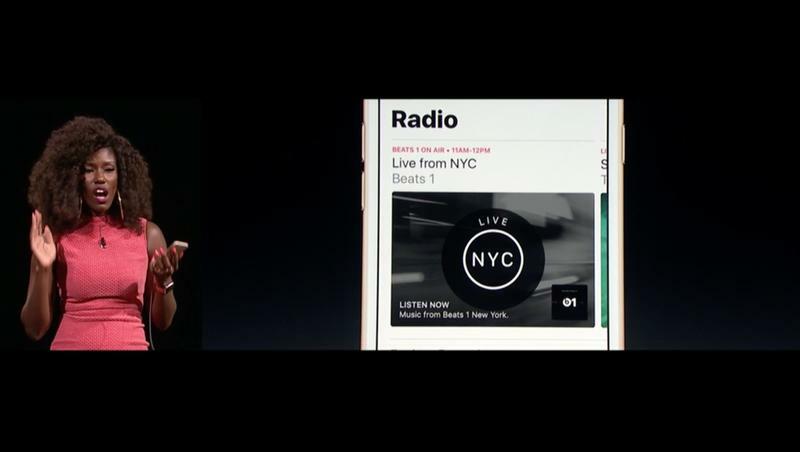 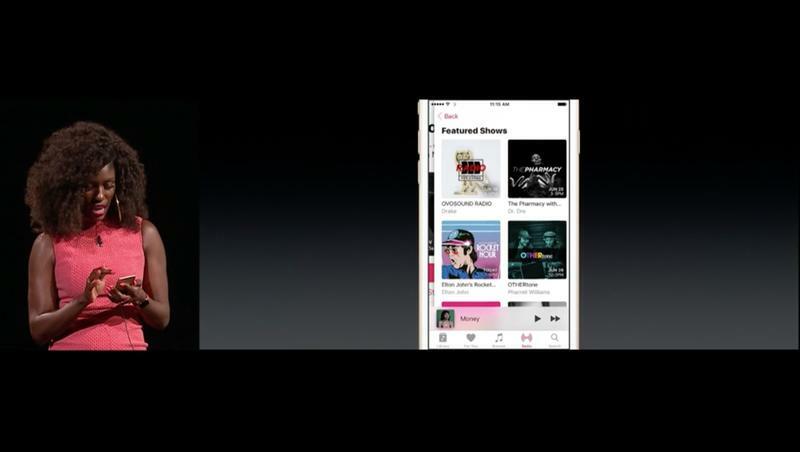 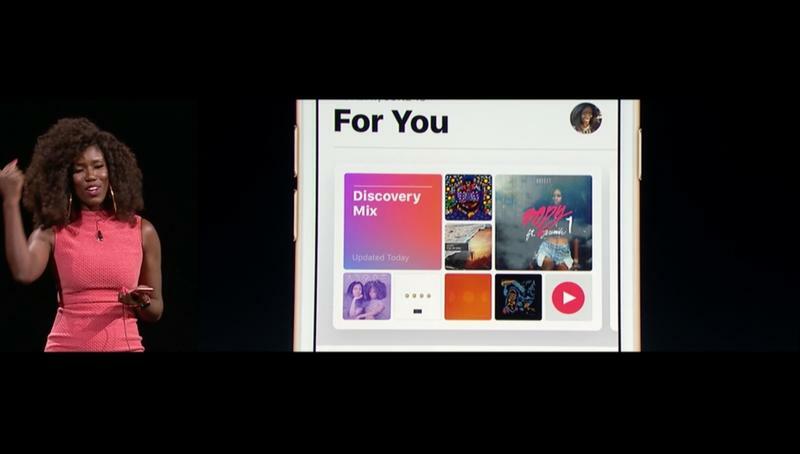 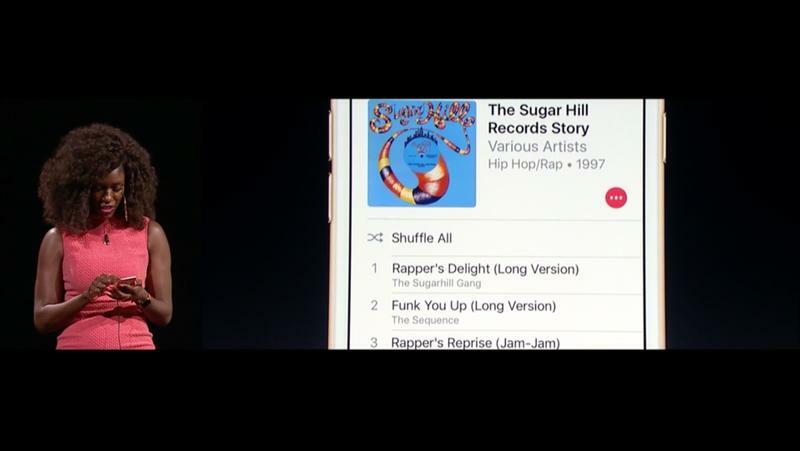 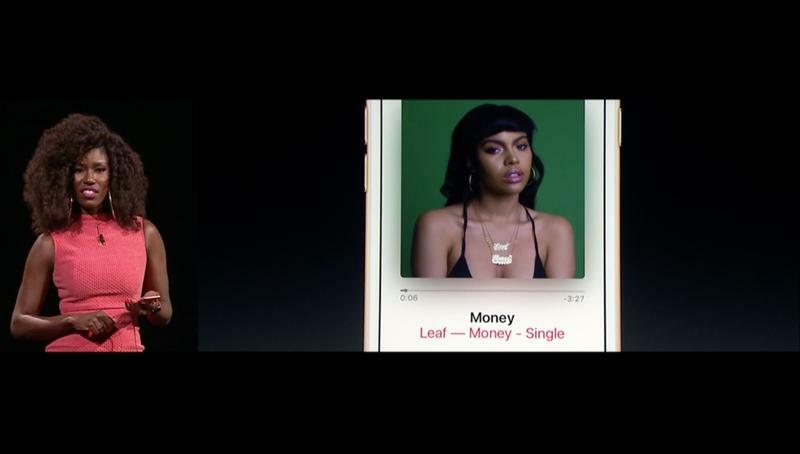 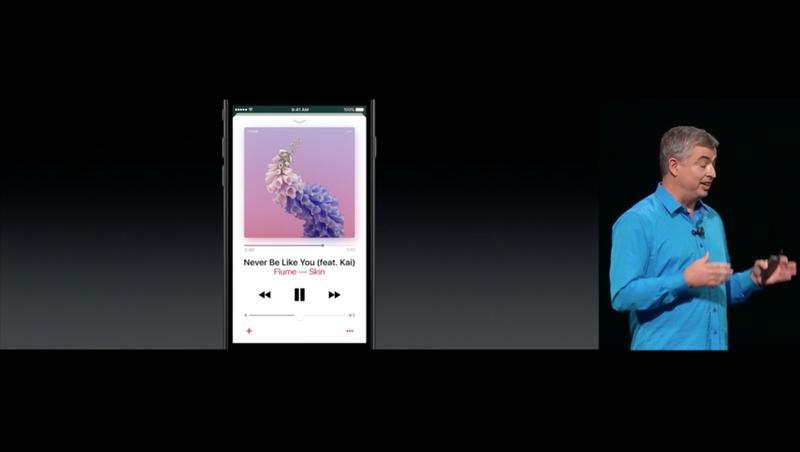 Apple Music is also getting a full redesign, which had been rumored long before WWDC 2016. 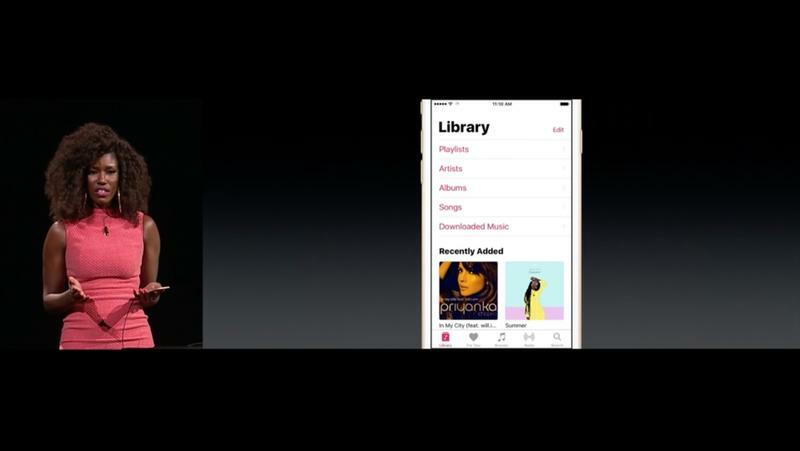 Oddly, it actually looks pretty similar to the recent app, though with new Library, For You, Browse, Radio tabs that Apple says is “more intuitive and familiar.” The first tab is the library, which breaks out into playlists, artists, albums, songs and a new section called “Downloaded music” which shows everything that’s stored on your iPhone. 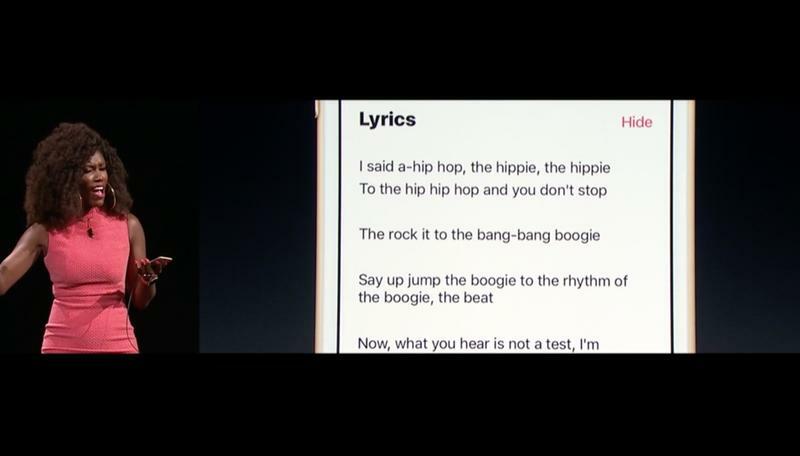 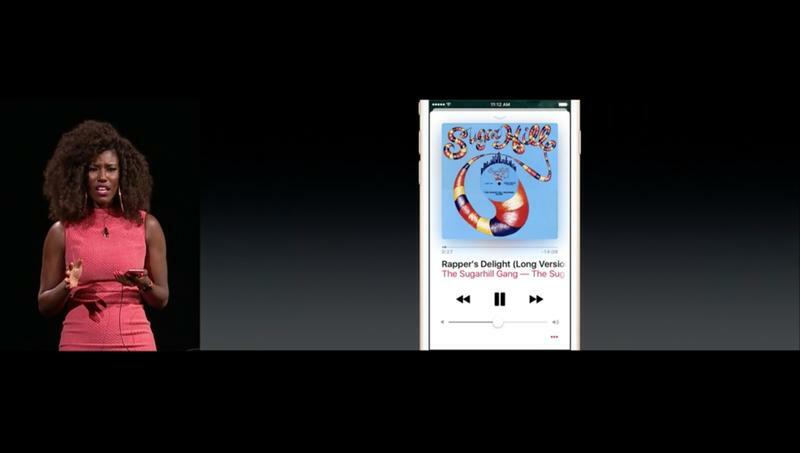 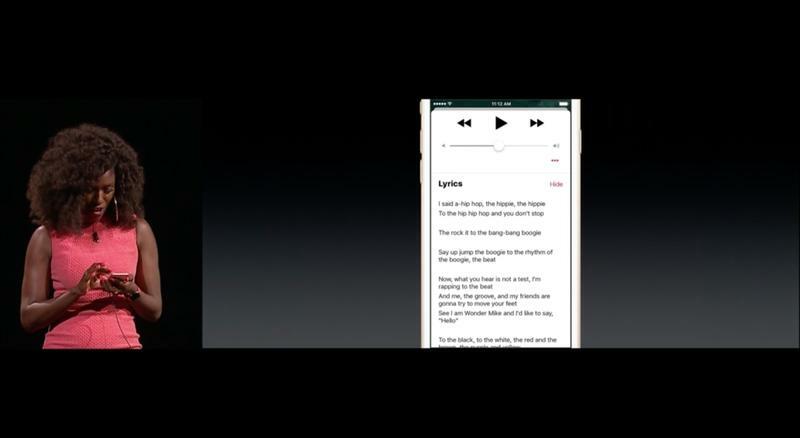 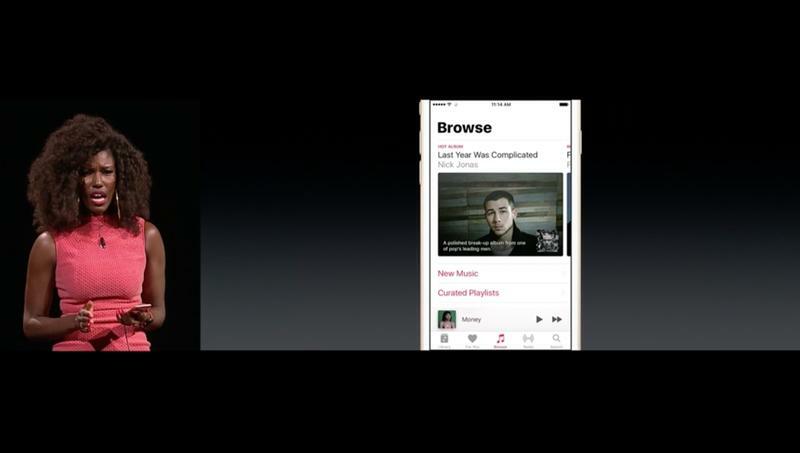 When you play a song and open it, you’ll see controls, artwork and even lyrics, which is a nice new feature. 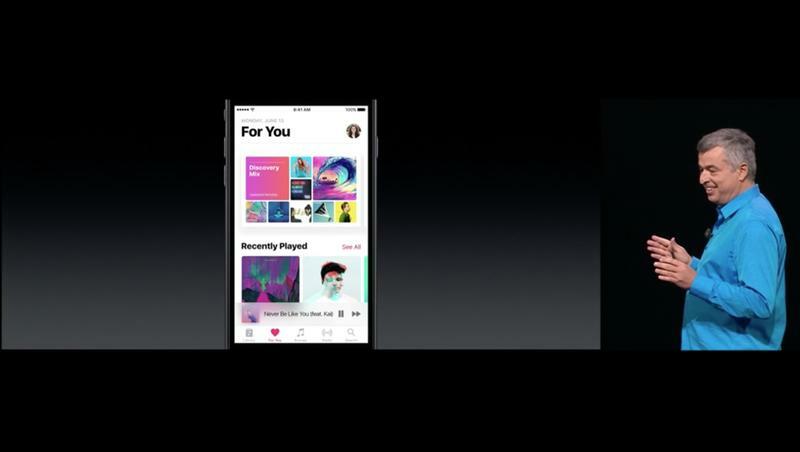 Another option being added is “Daily curated playlists” that are curated specifically for each user. 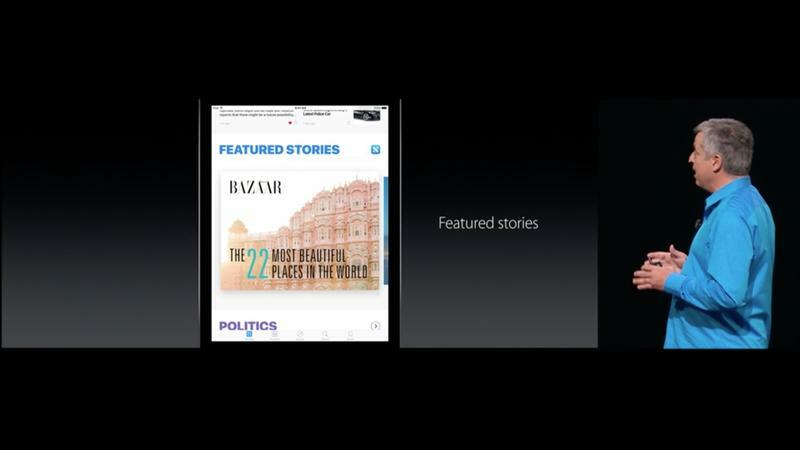 Apple News is getting redesigned with featured stories that are handpicked by editors. 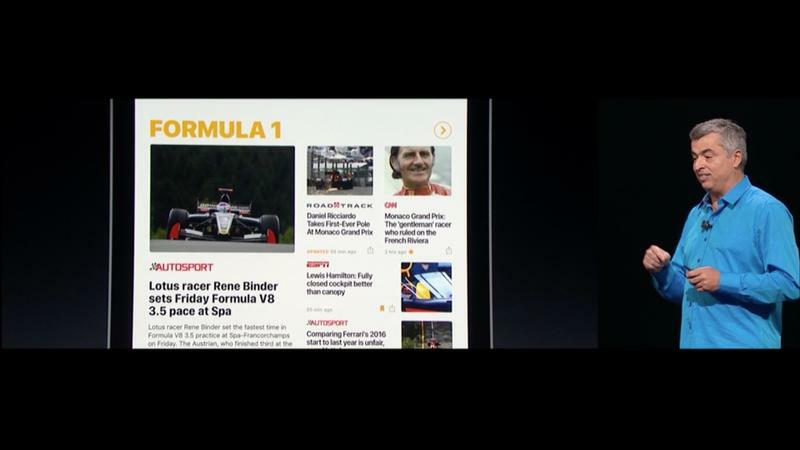 Users can subscribe to magazines and newspapers, breaking news notifications, and a brand new design. 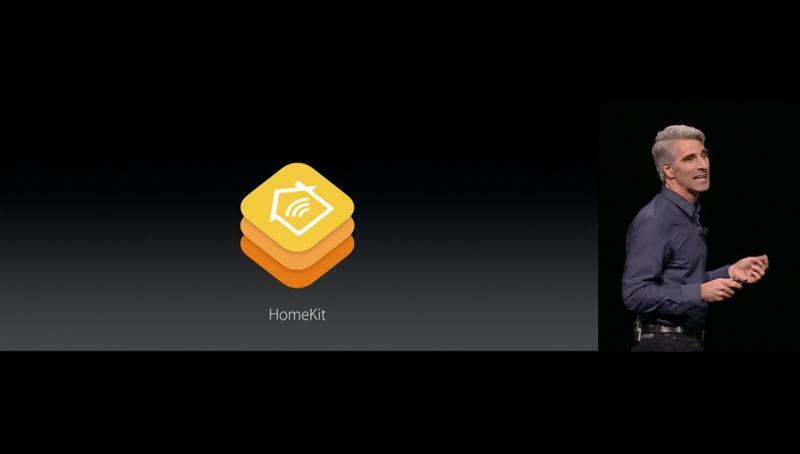 HomeKit is also getting an update in iOS 10. 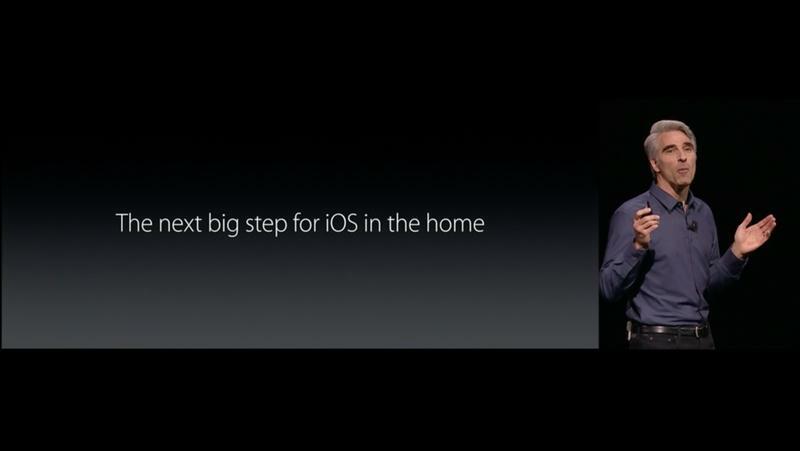 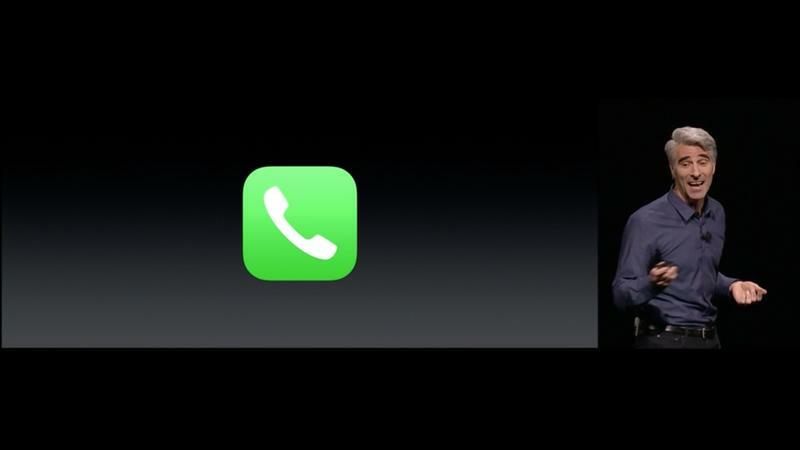 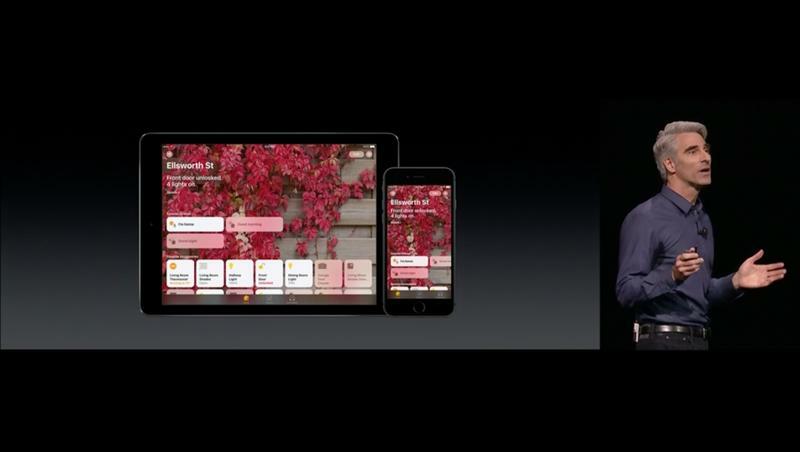 It’s going to exist as a standalone app called “Home” that will exist on your homescreen. 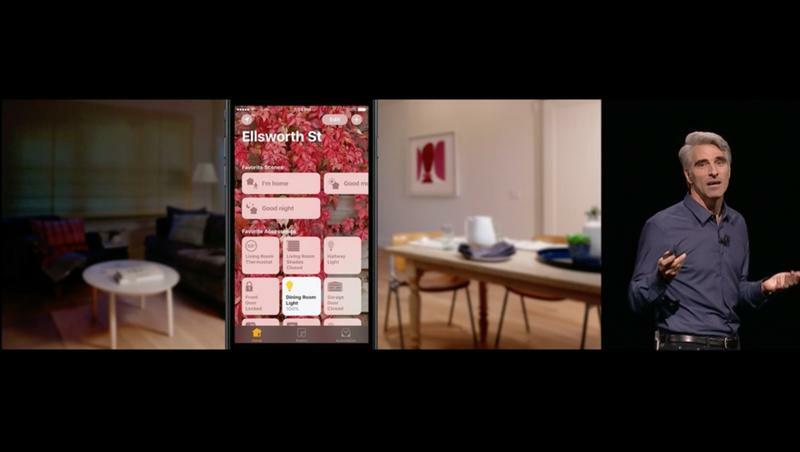 You can control lights and other features that are connected to your home “no matter who made it,” Apple said. 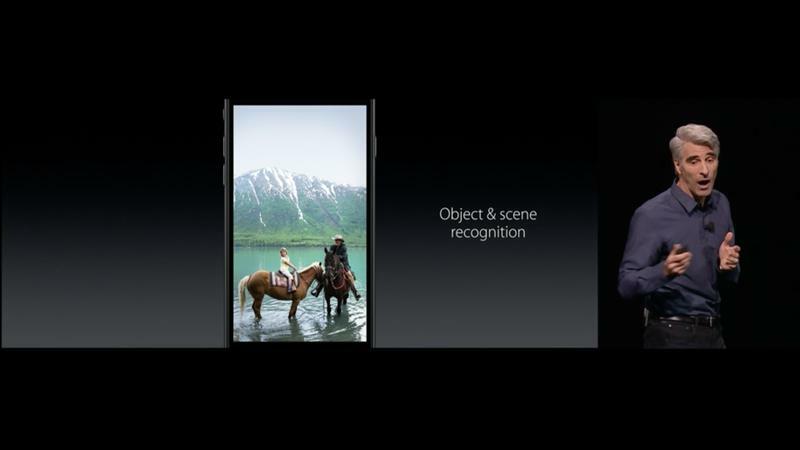 There are scenes, too. 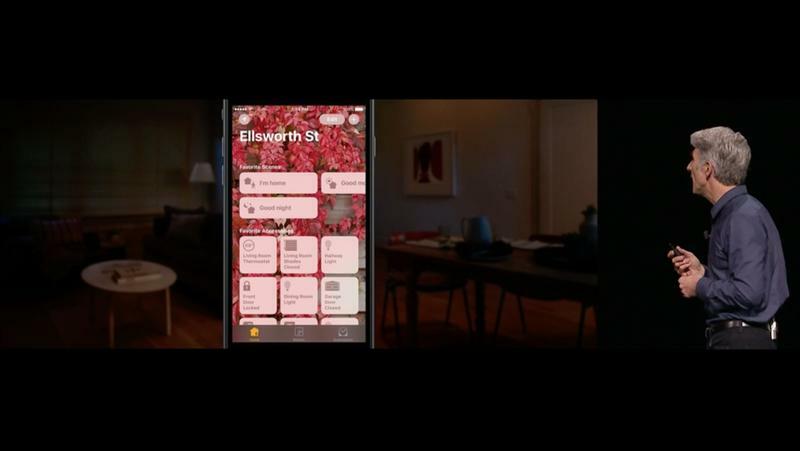 One, called “Goodnight” preps the house for bedtime. 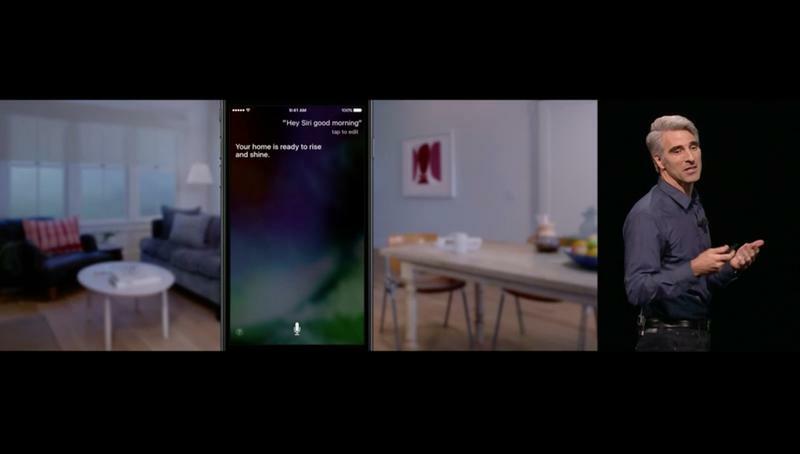 If you say “Siri, Good morning,” the app can prep your house with your custom settings for the day. 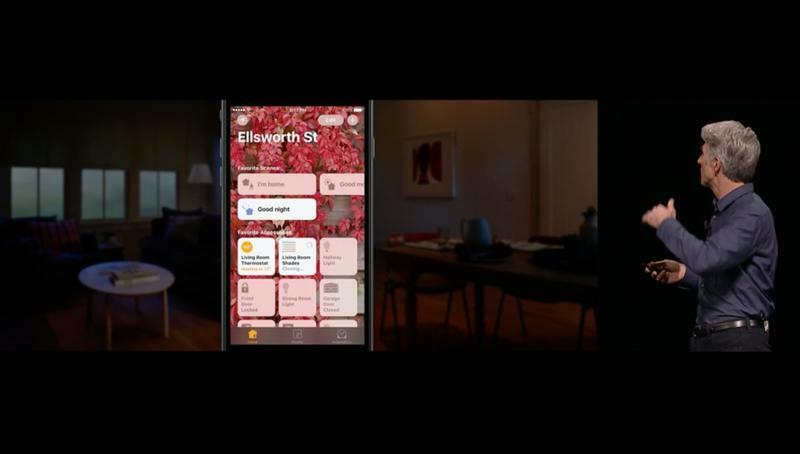 It can embed with the lockscreen, too, so you can see a connected doorbell or camera on the front door and receive a notification when the doorbell rings. 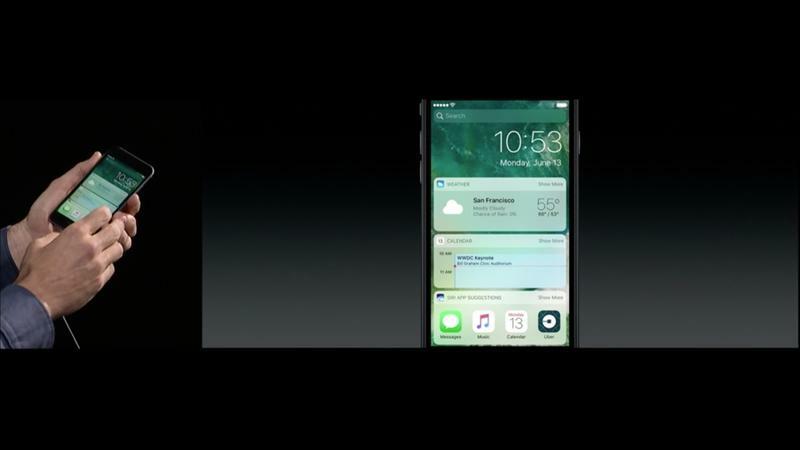 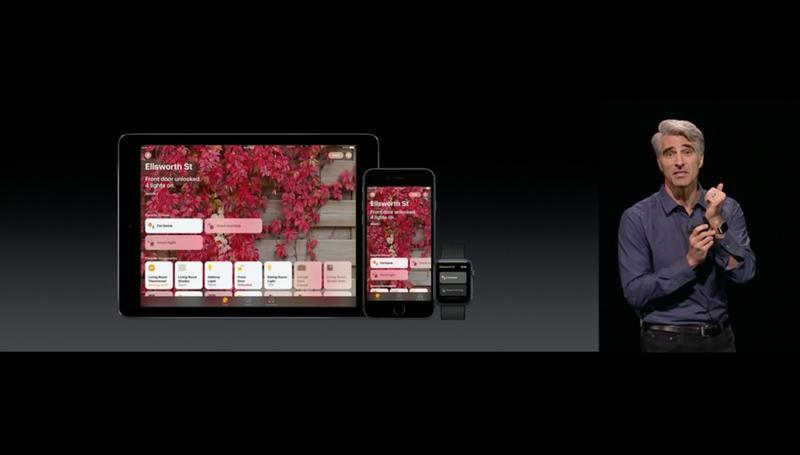 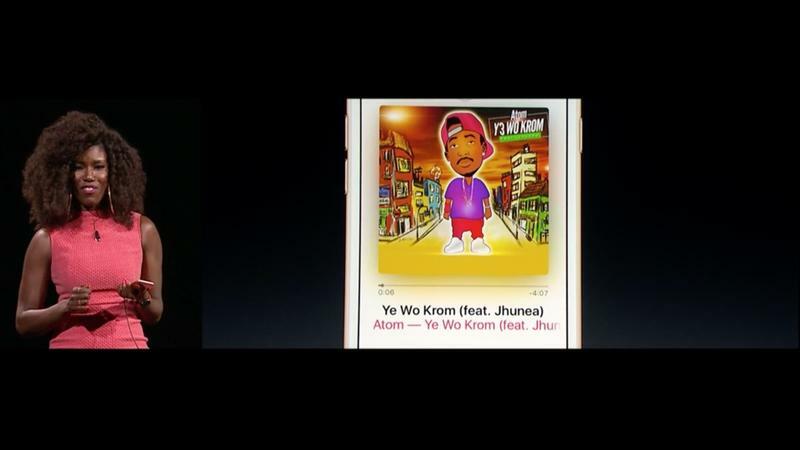 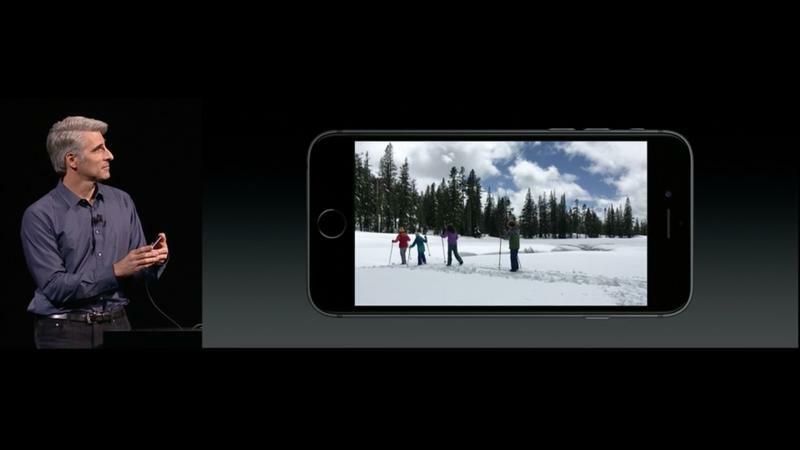 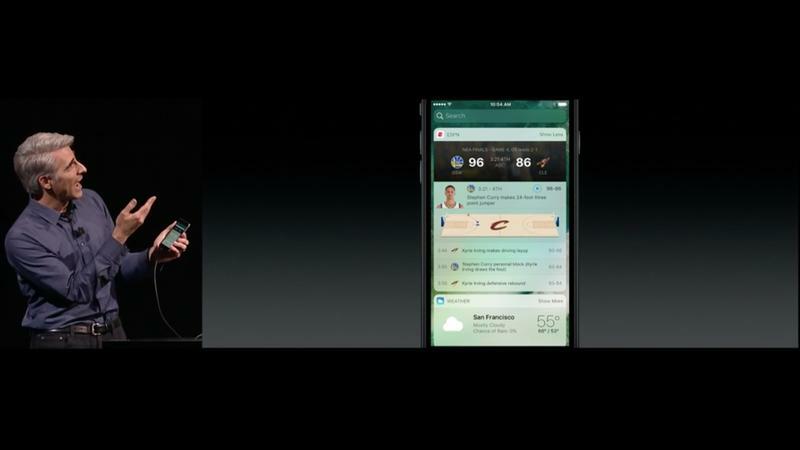 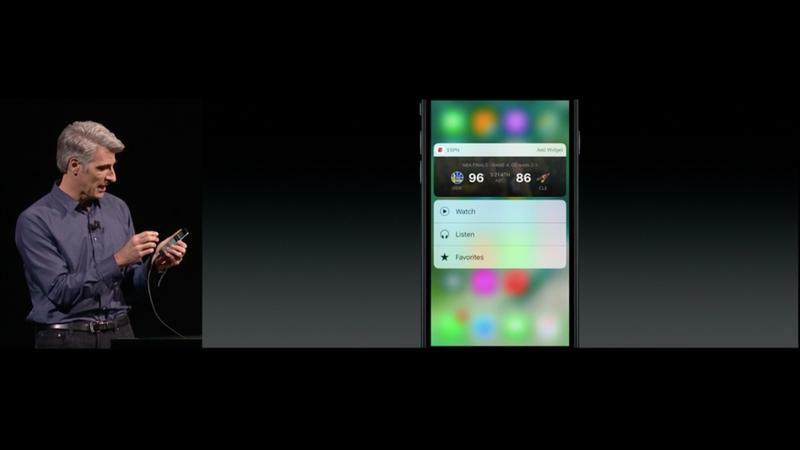 Other features include geofencing (again, working with the “scenes”), support for all iOS devices and the Apple Watch. 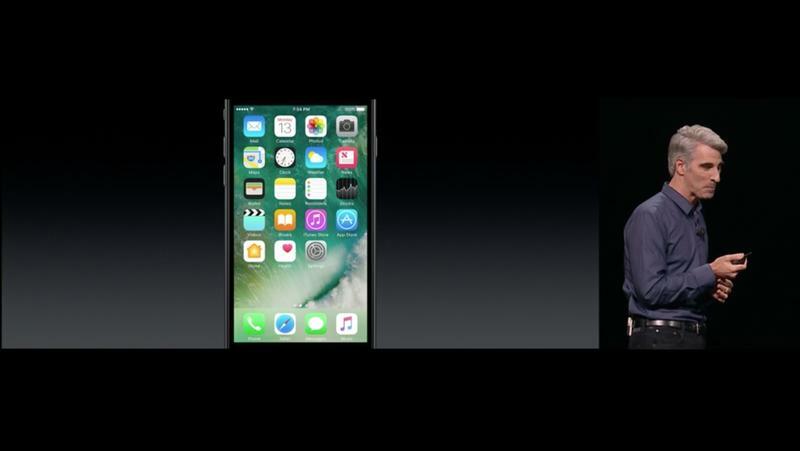 The Phone app is also getting updated in iOS 10. 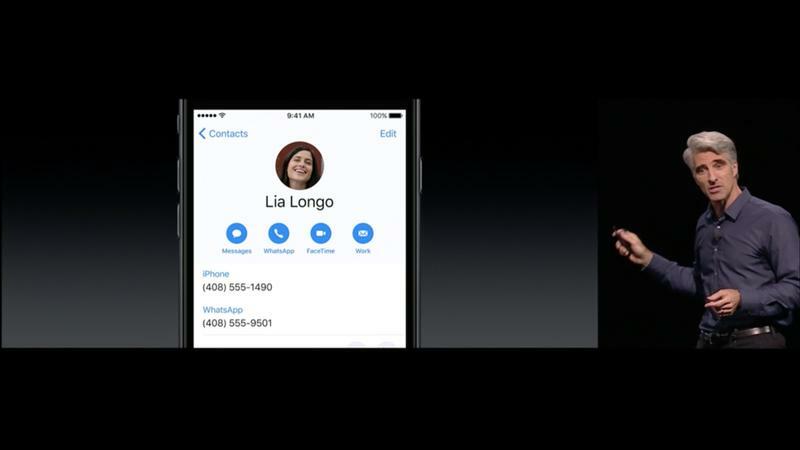 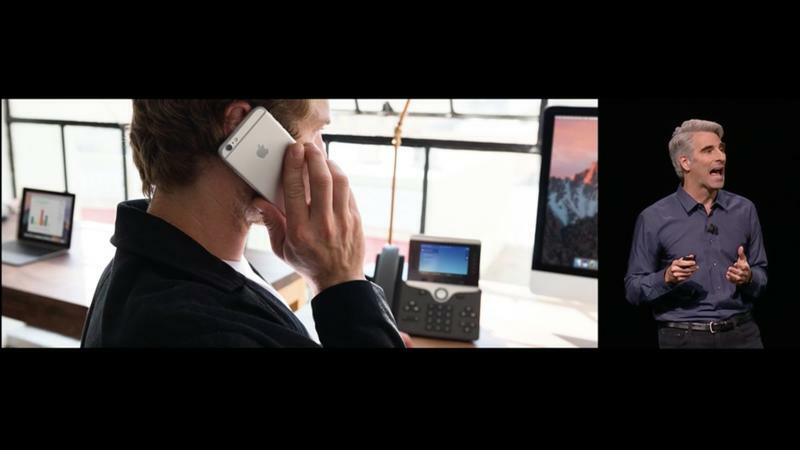 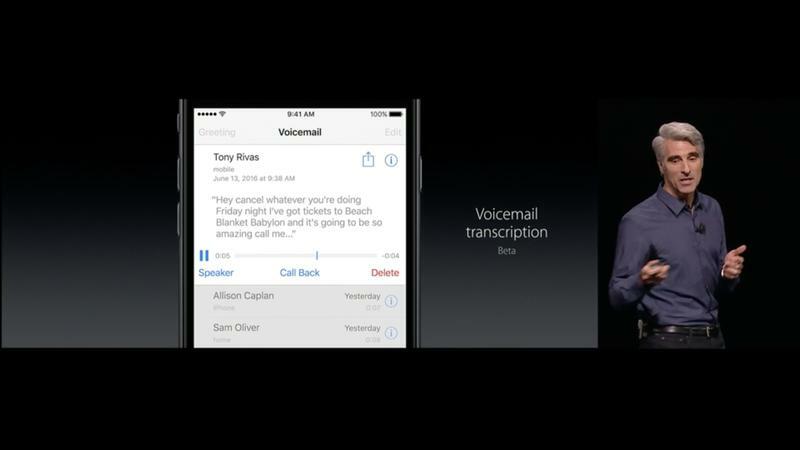 Voicemail transcription will be enabled, as will support for seeing who is calling through VoIP apps, which will appear as normal phone calls. 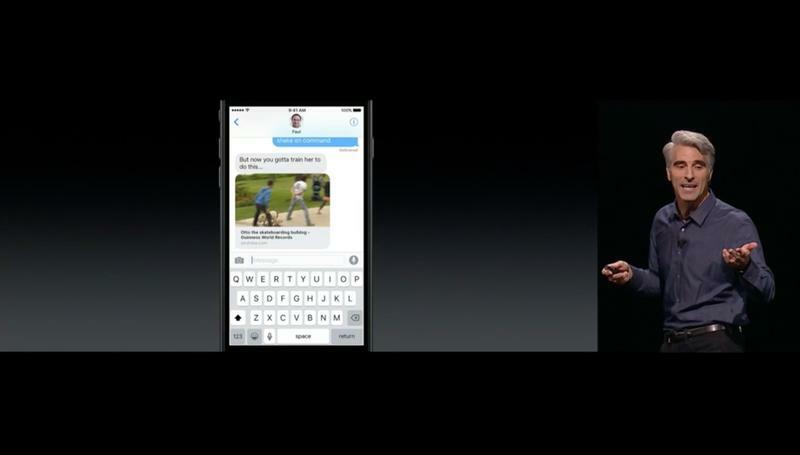 That’s great for WhatsApp users, for example. 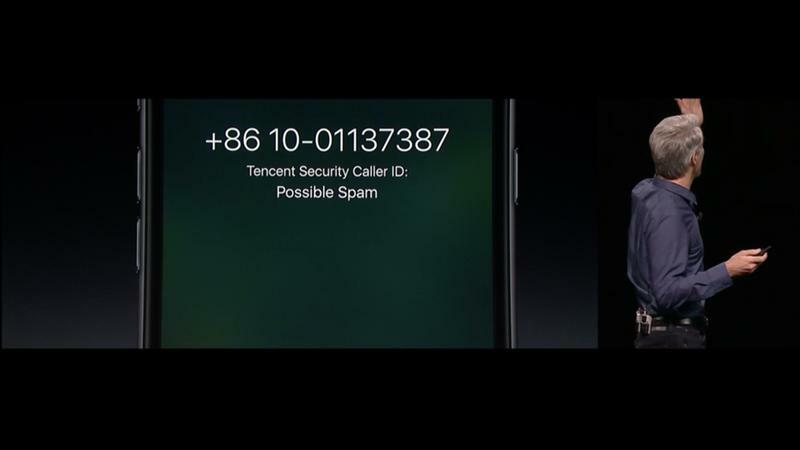 If it detects a number that might be spam, the phone app will also let you know that it’s “possible spam” so you don’t need to answer. 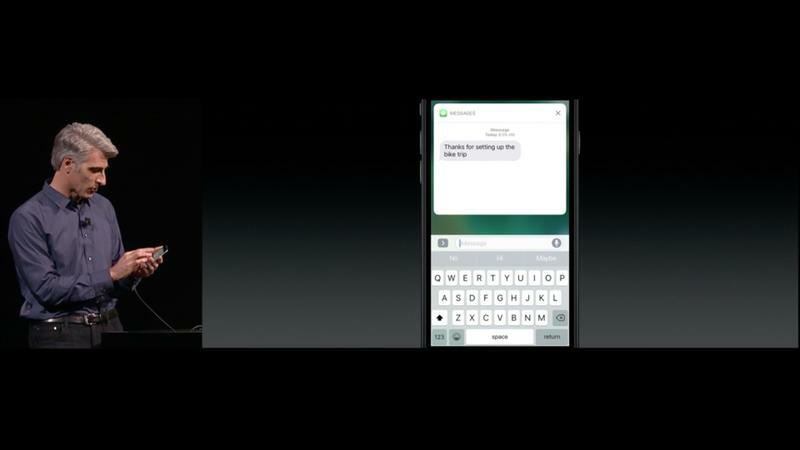 Messages will now support right text messages so, if someone shares a link, it’ll pull in all the relevant information like artwork from the website, titles and more. 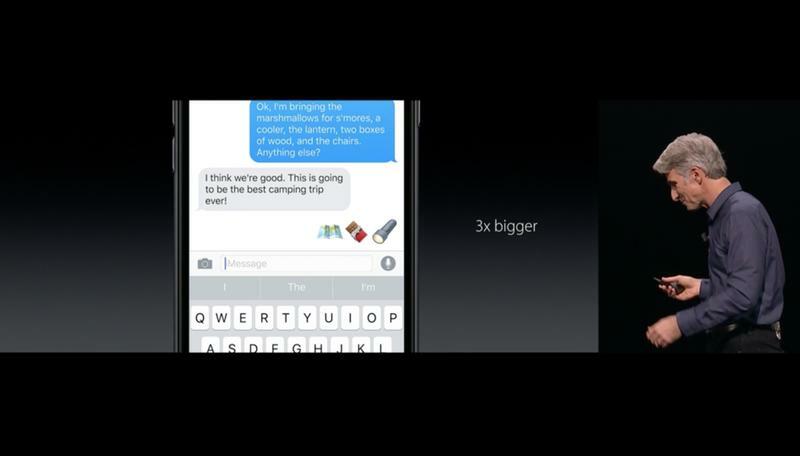 Emoji are also now 3x bigger. 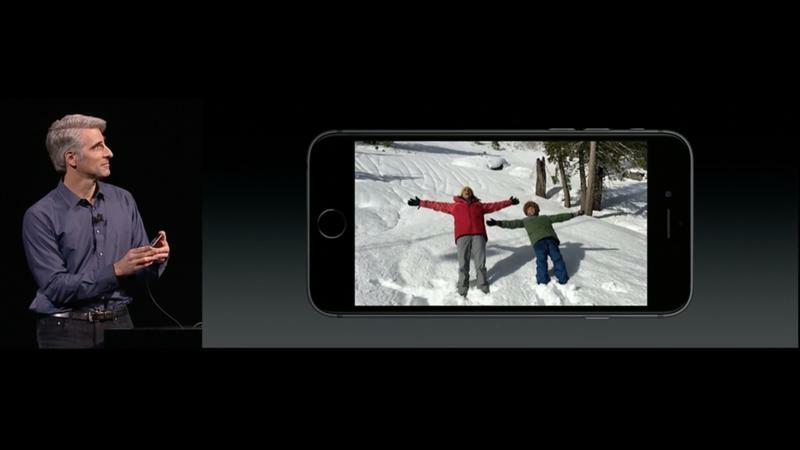 The camera, when you open it now, shows exactly what you’re looking at. 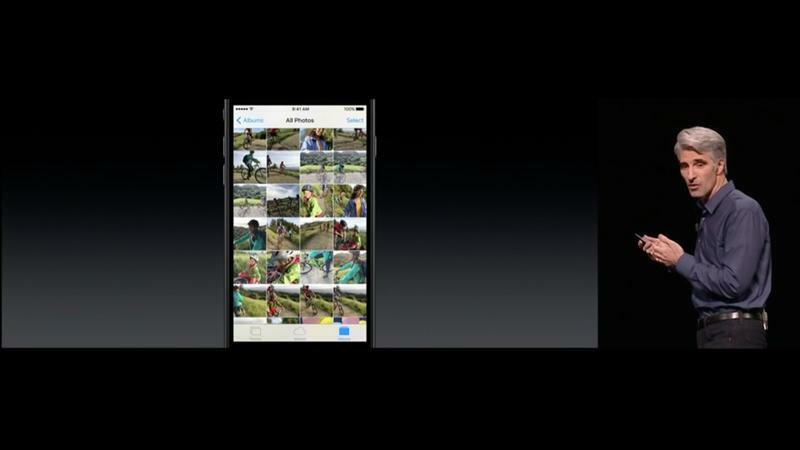 A quick slide-over shows you the gallery to quickly insert them. 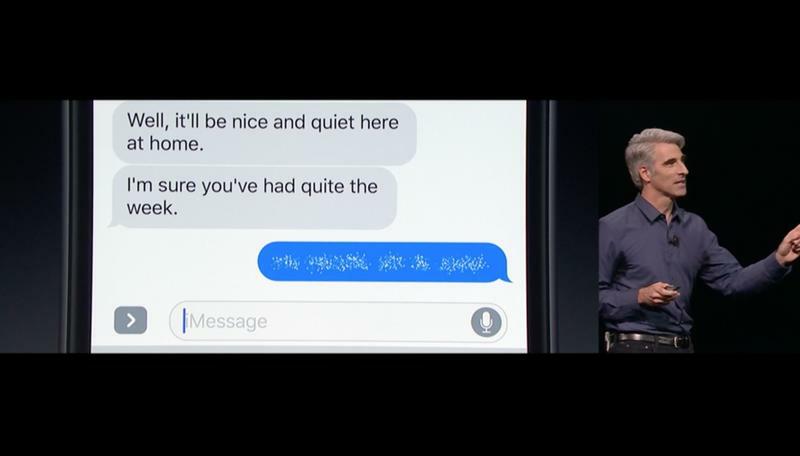 Text predictions are also smarter and works can automatically replace words (the pizza emoji in place of the word pizza, for example). 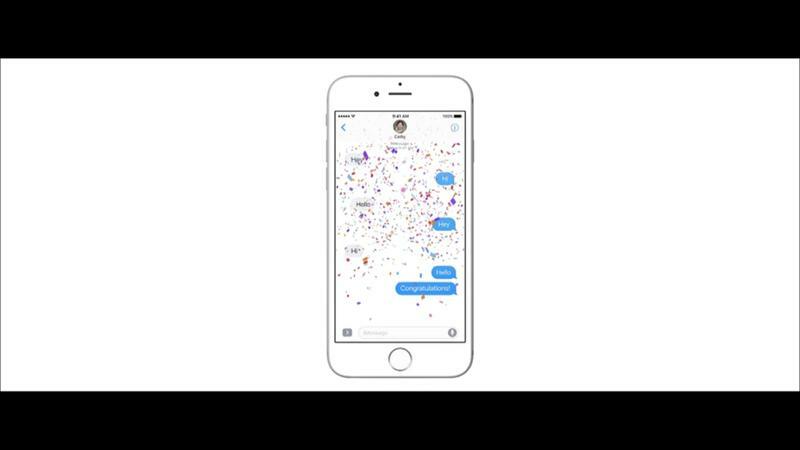 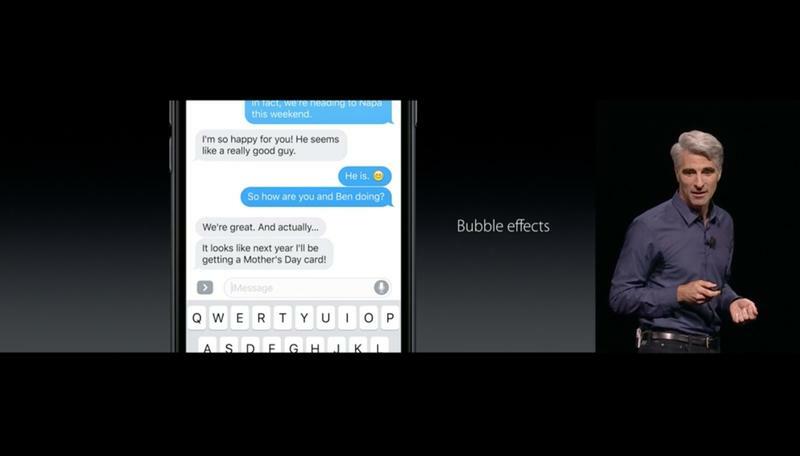 Another feature, “Bubble effects” adds new effects to the blue bubbles that you see in iMessage. 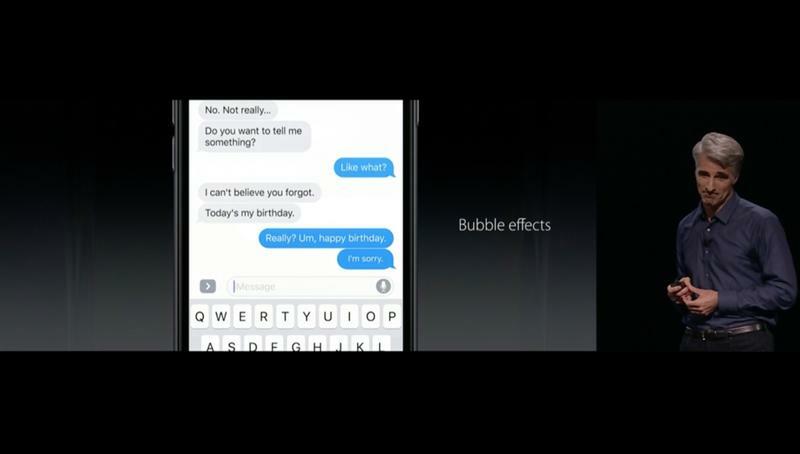 These are basically small animations for each bubble. 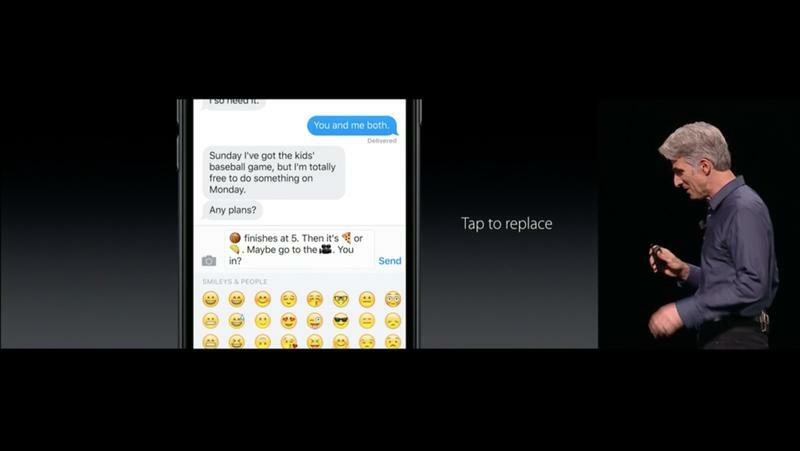 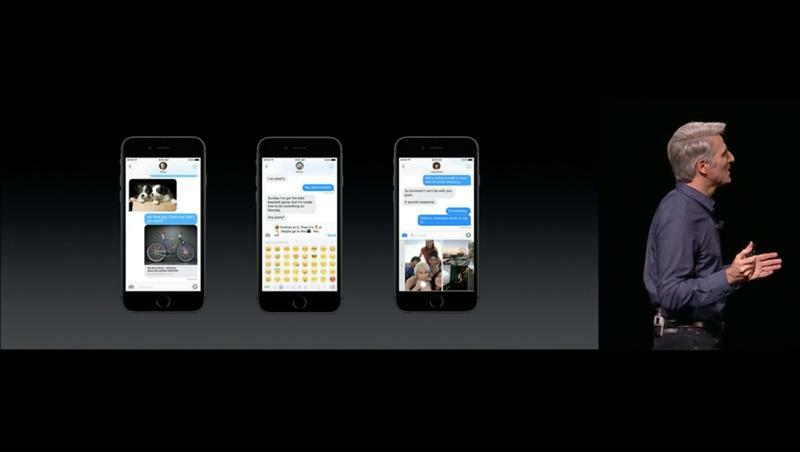 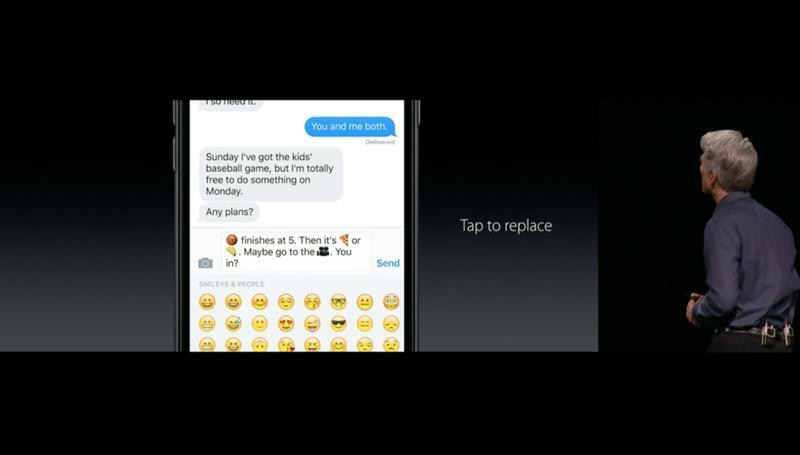 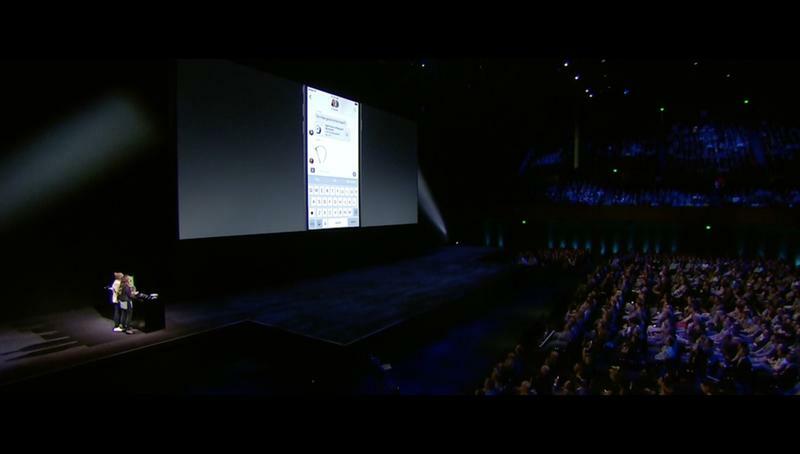 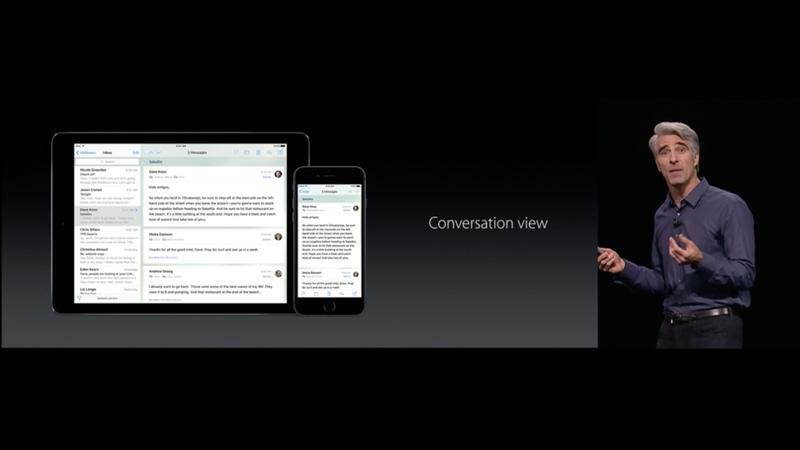 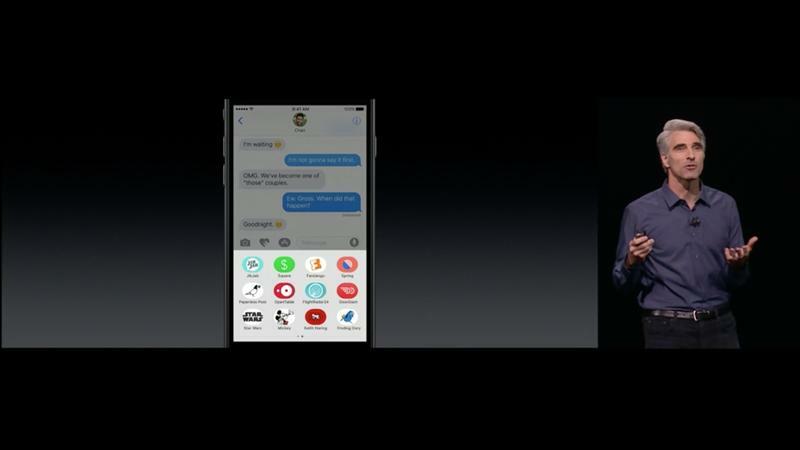 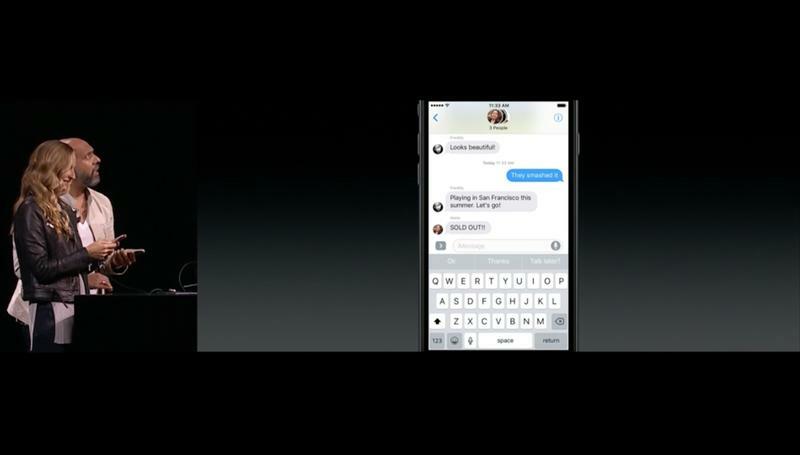 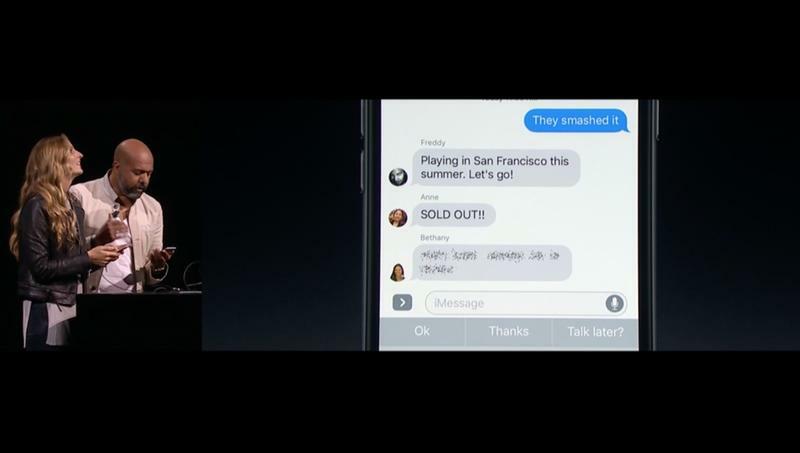 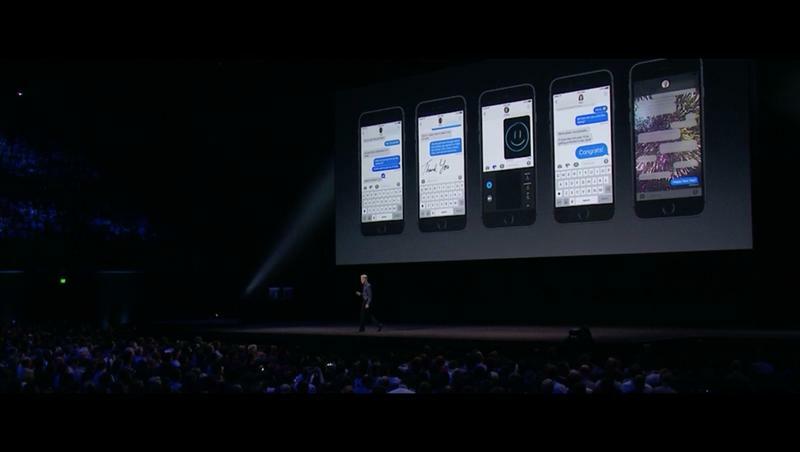 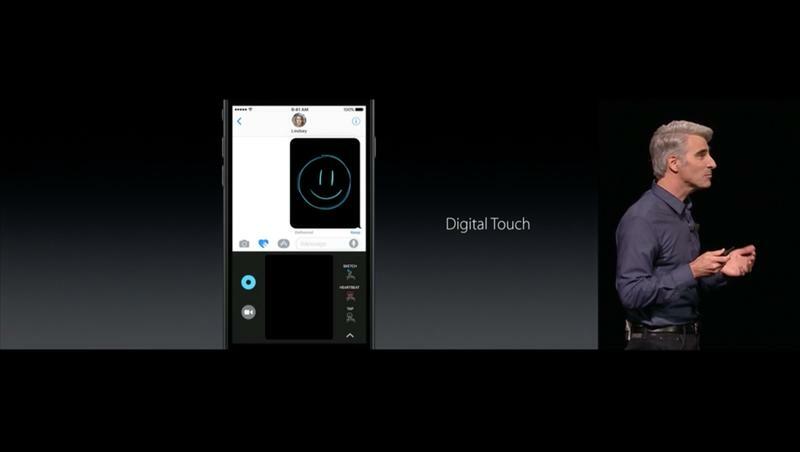 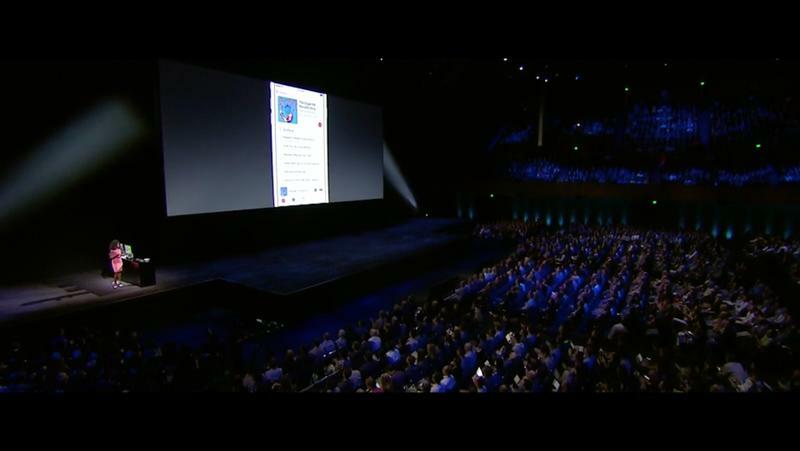 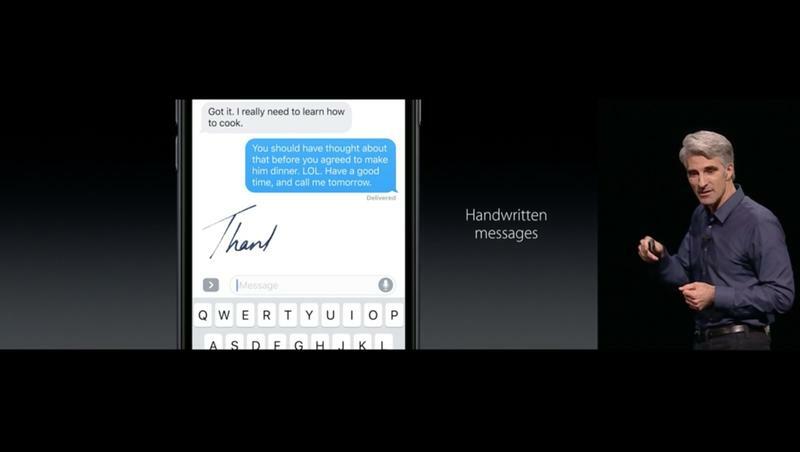 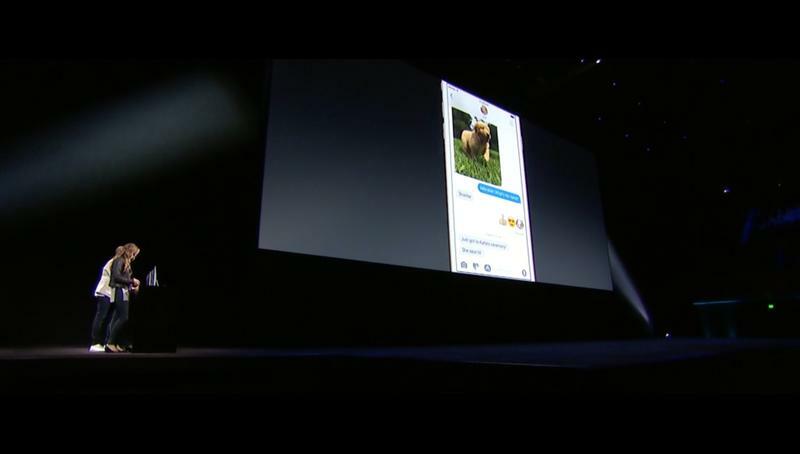 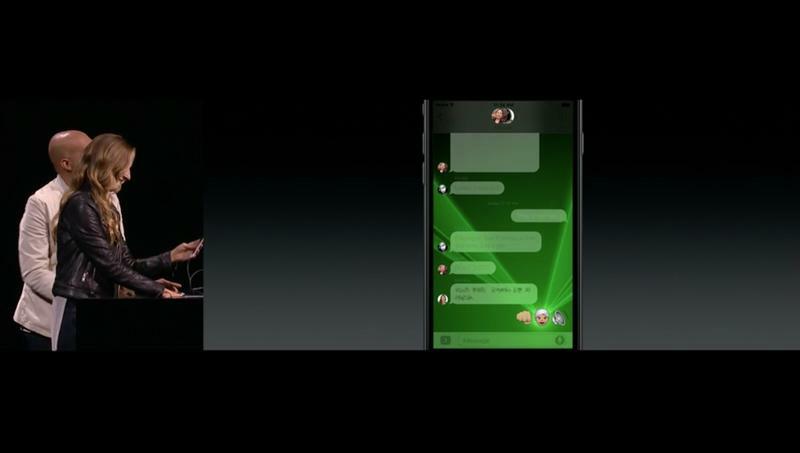 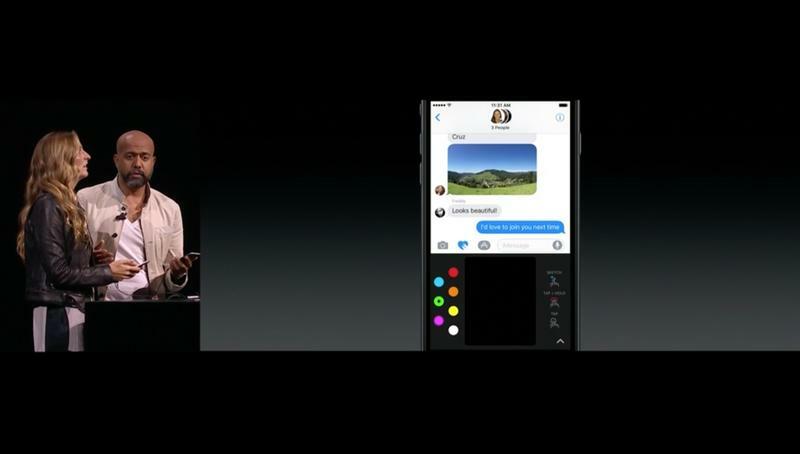 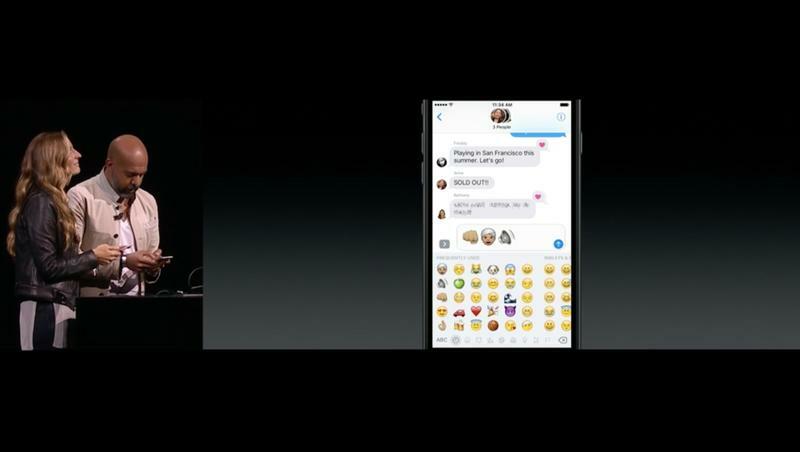 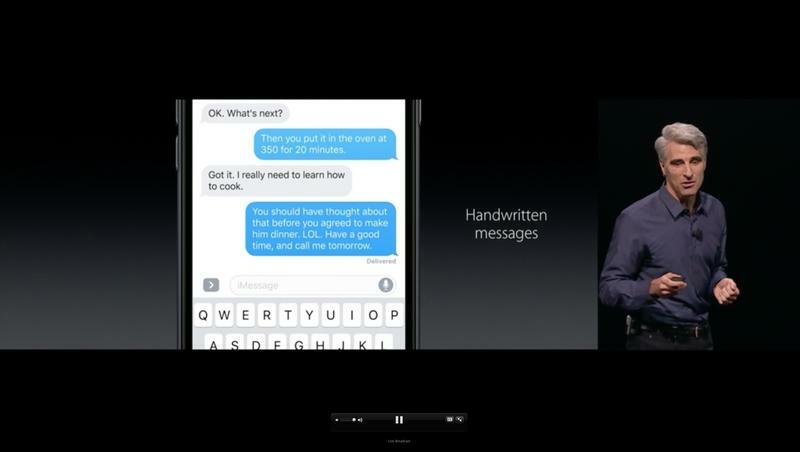 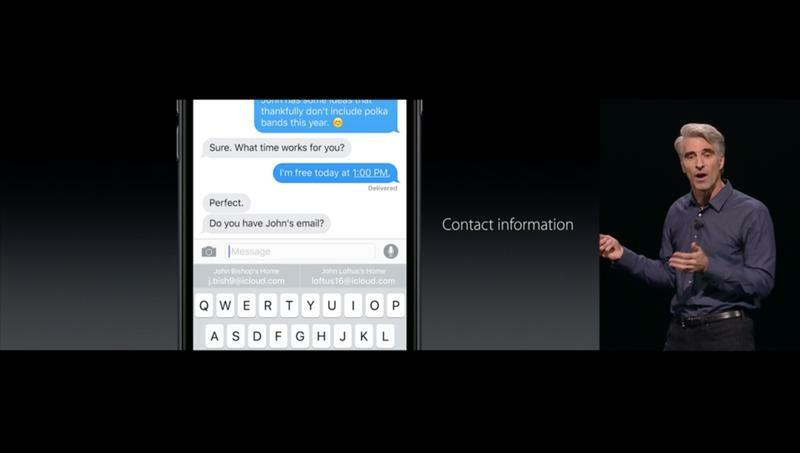 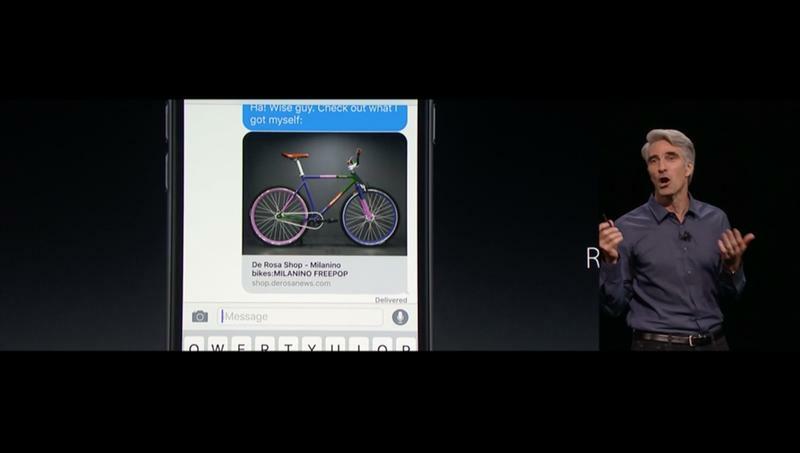 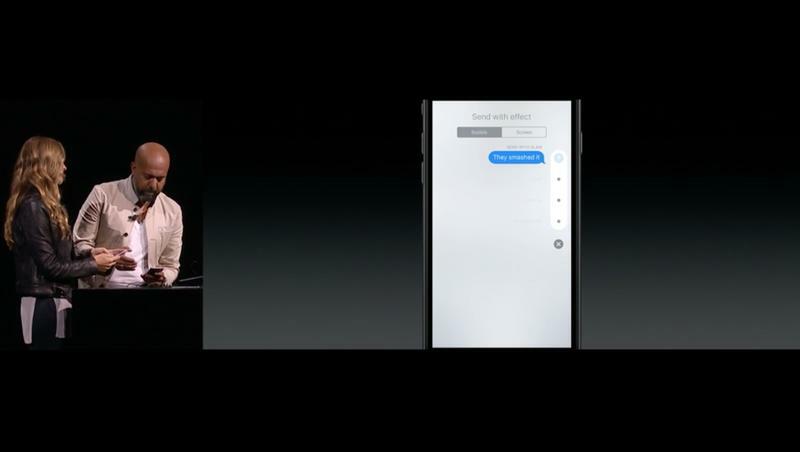 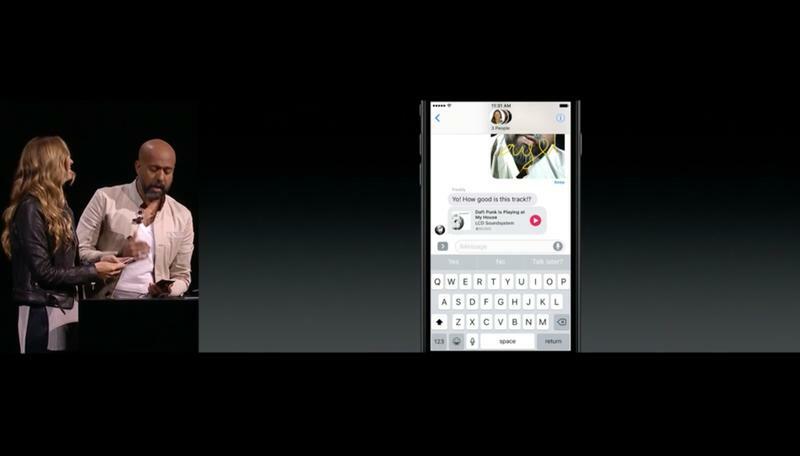 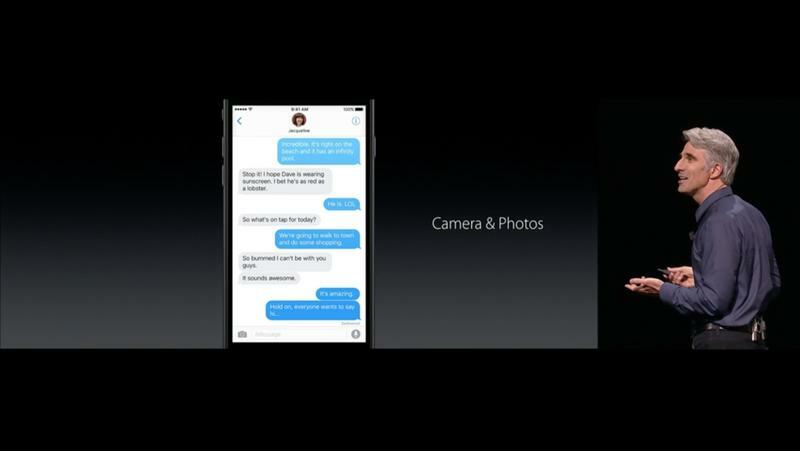 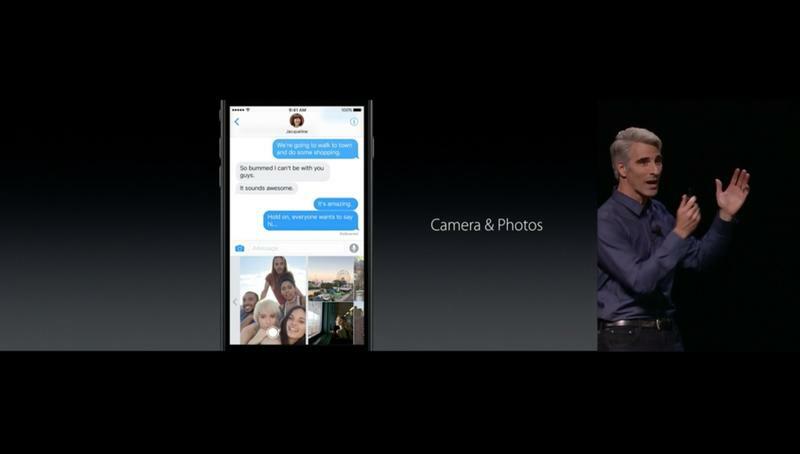 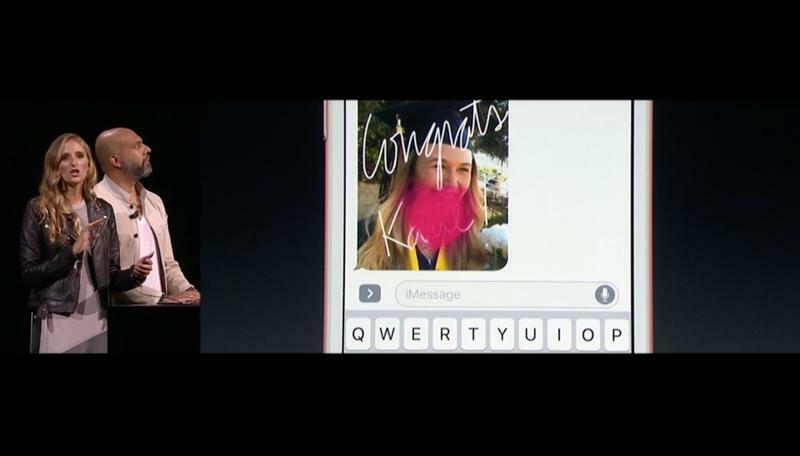 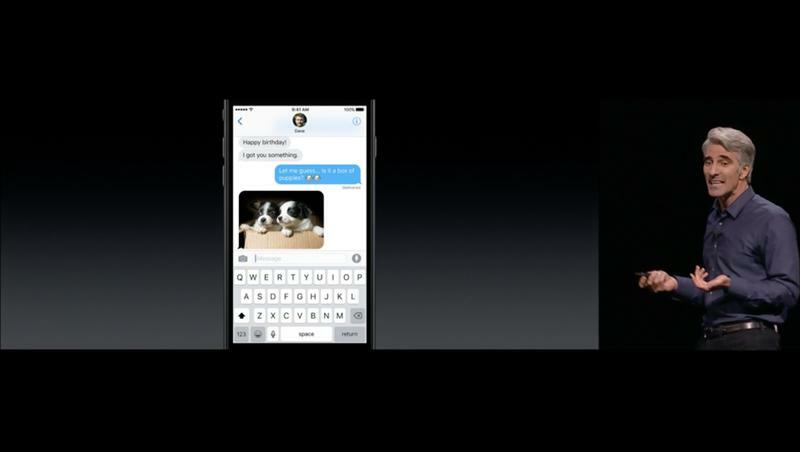 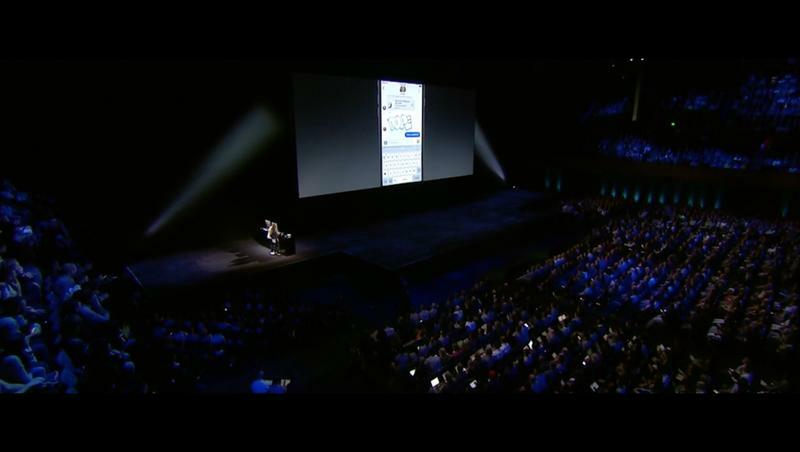 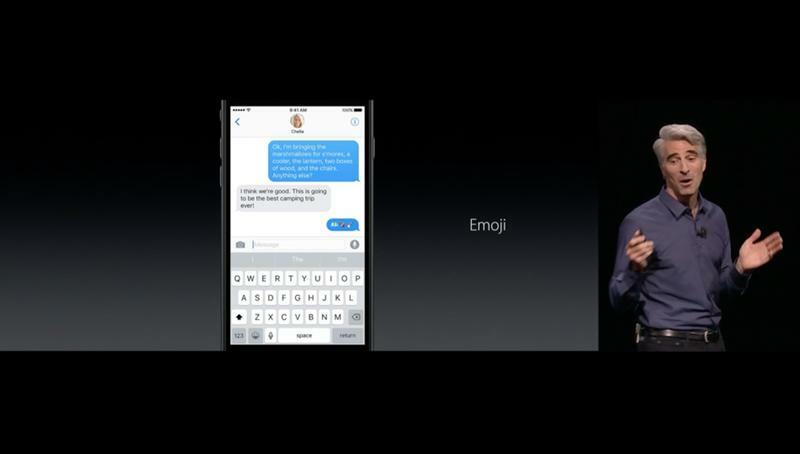 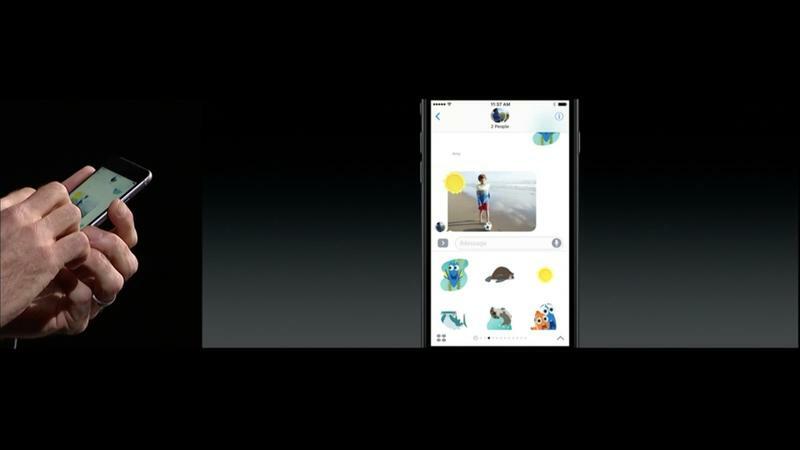 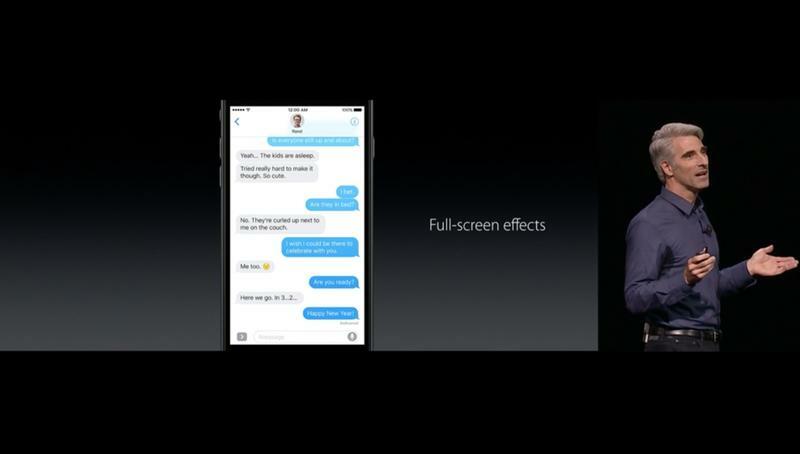 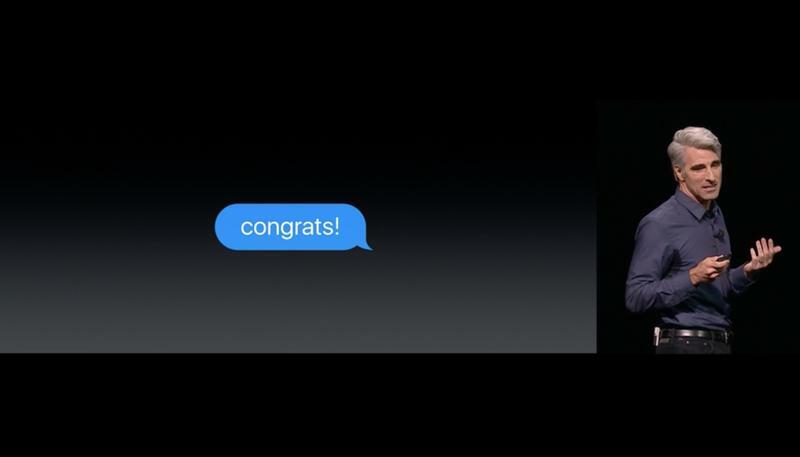 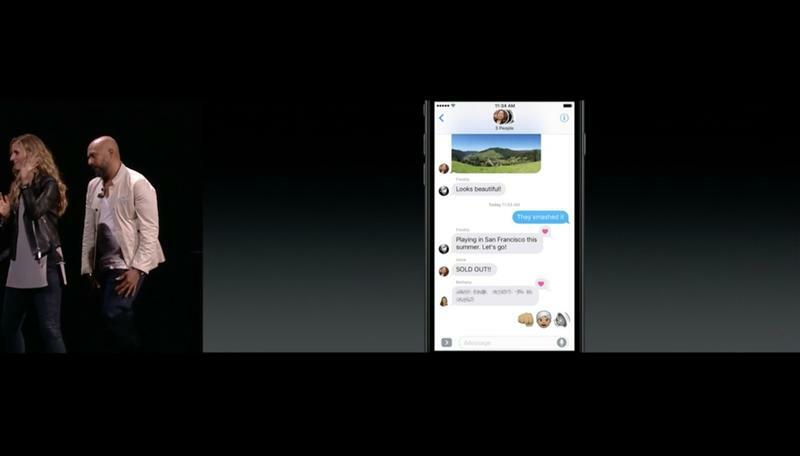 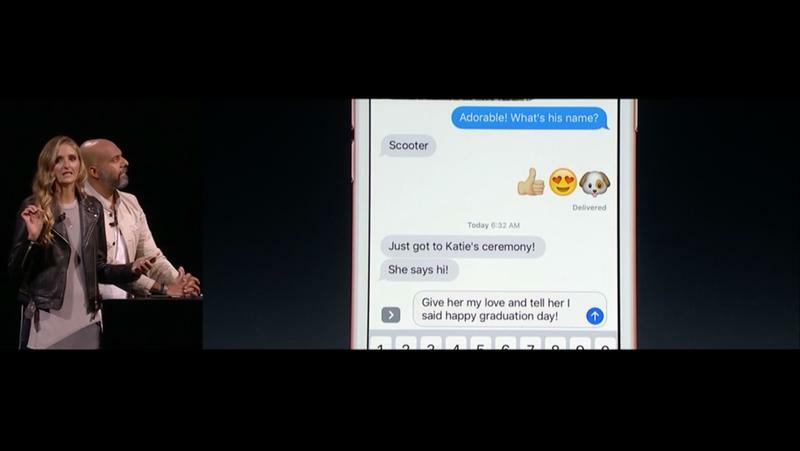 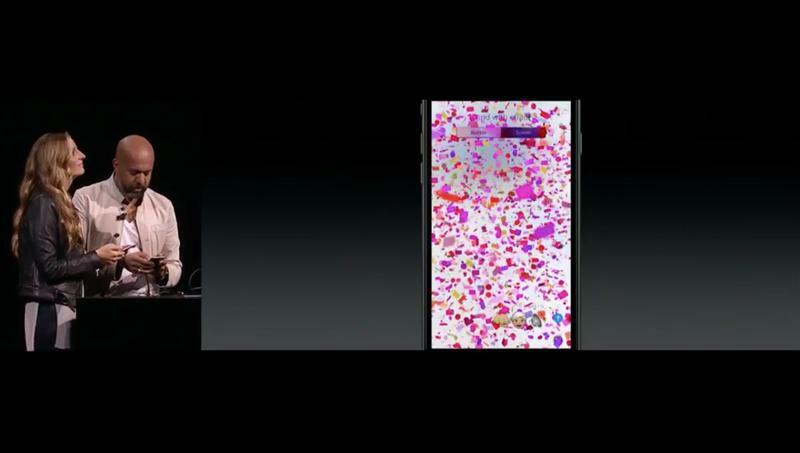 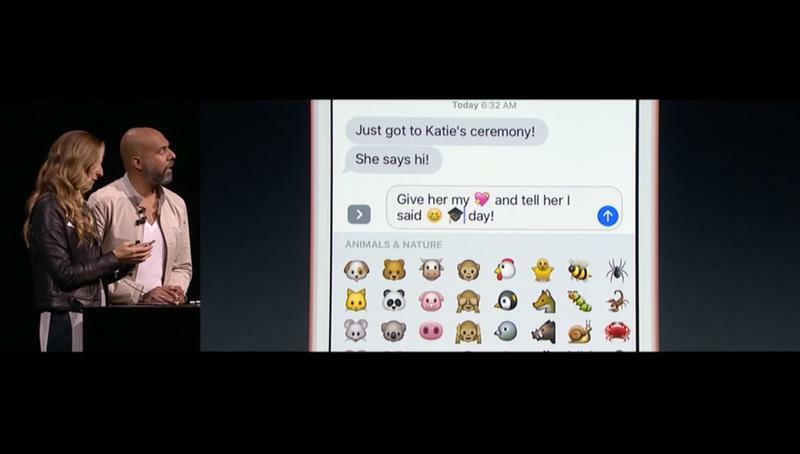 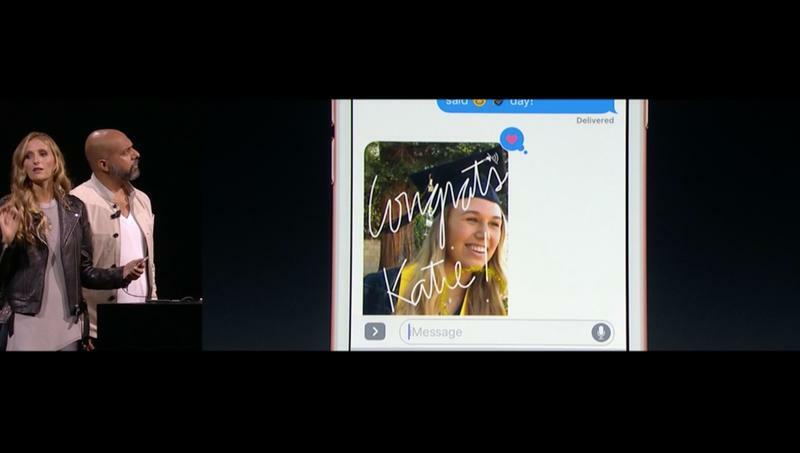 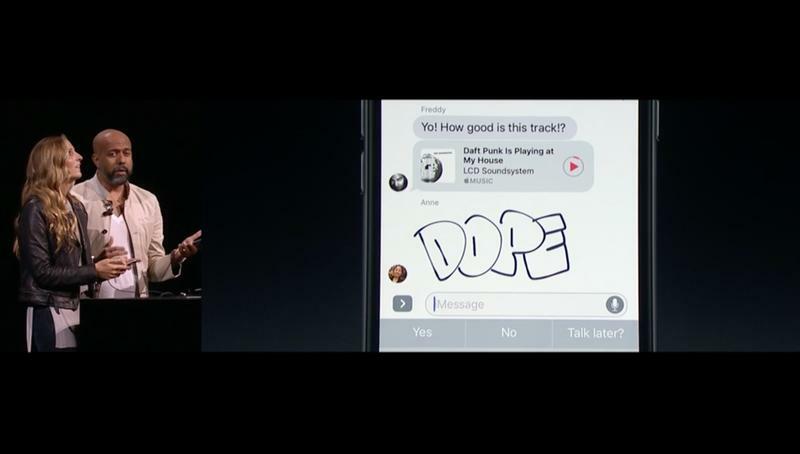 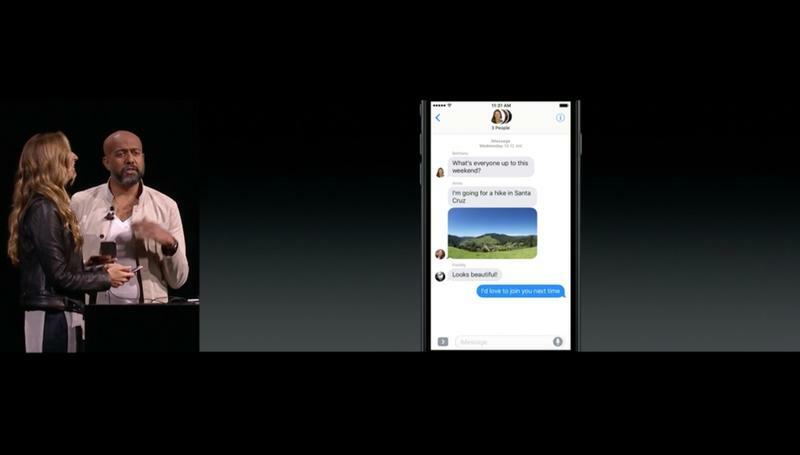 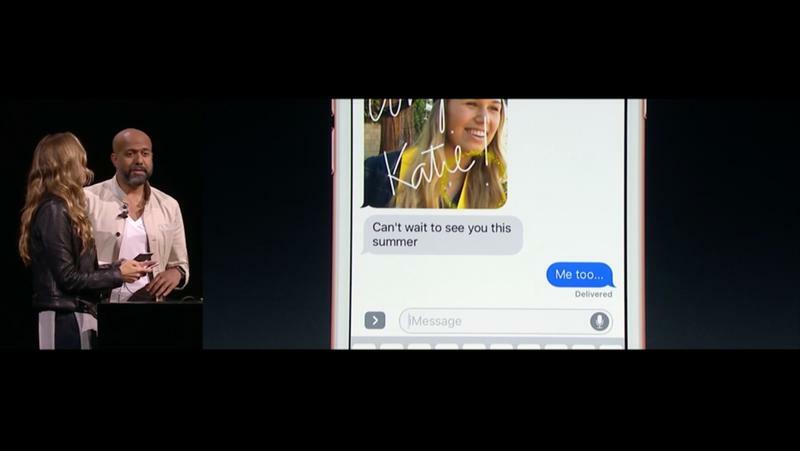 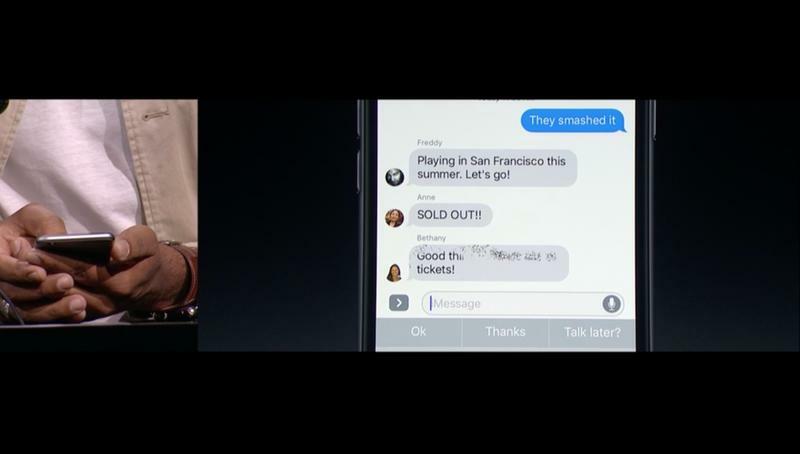 iMessage will also receive support for written text, allowing you to add handwritten messages to text messages. 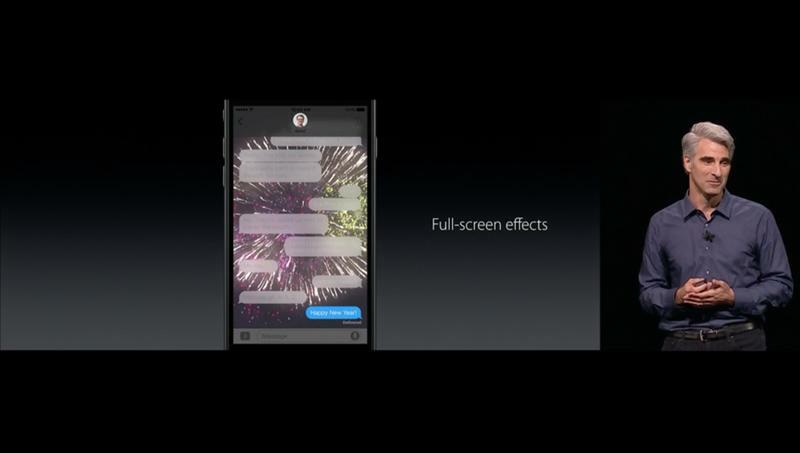 For a bit of flare, there are also full-screen effects. 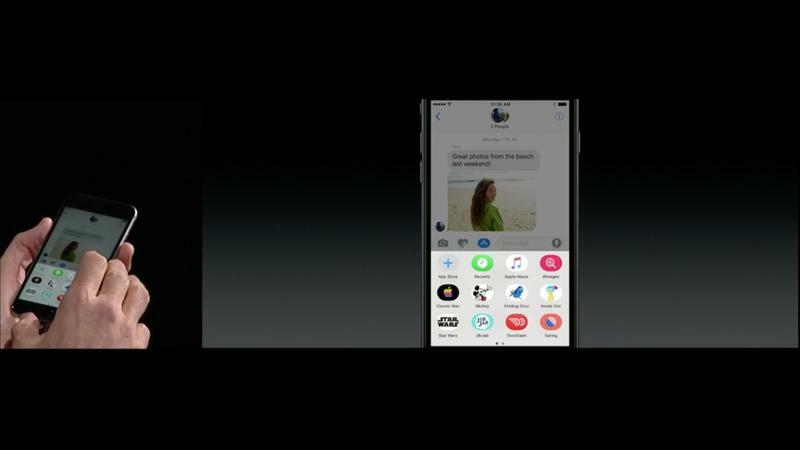 And for even more features, Apple said it’s finally developing iMessage to developers, which means we’ll get third-party apps for iMessage with a dedicated app store. 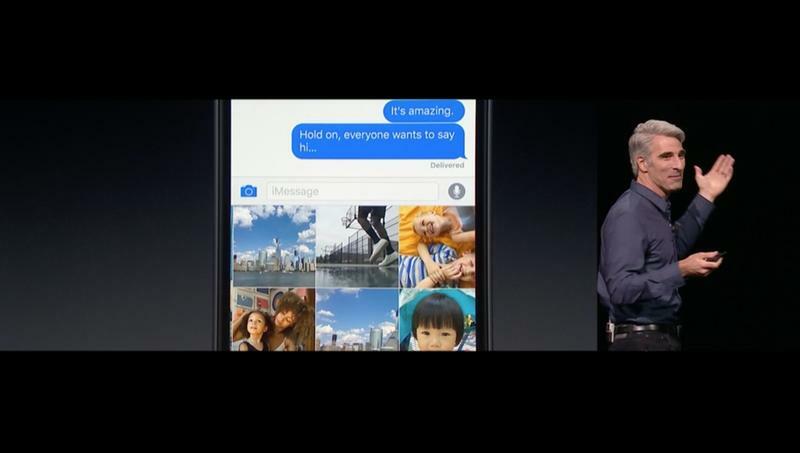 This is like Facebook Messenger. 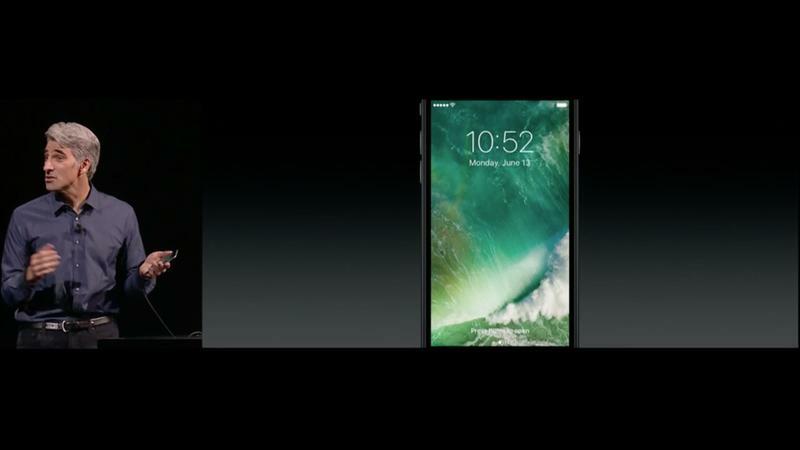 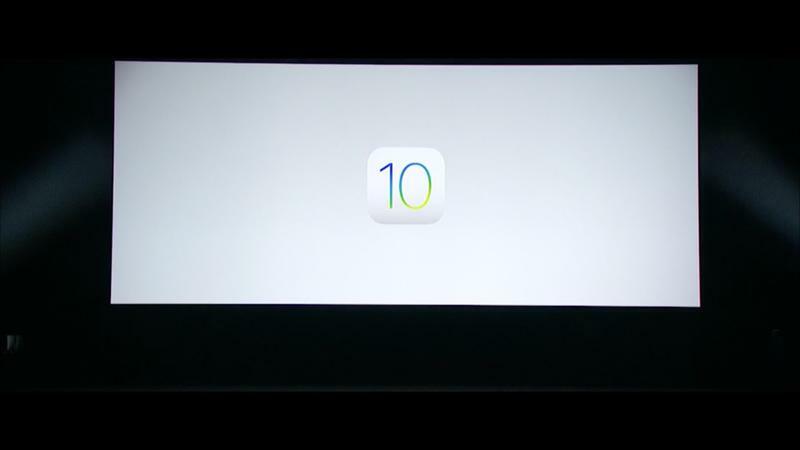 Other features in iOS 10 include notes collaboration, conversation view in Mail, support for multiple windows, split screen support in Safari on the iPad, Live Photos editing with digital video image stabilization and more. 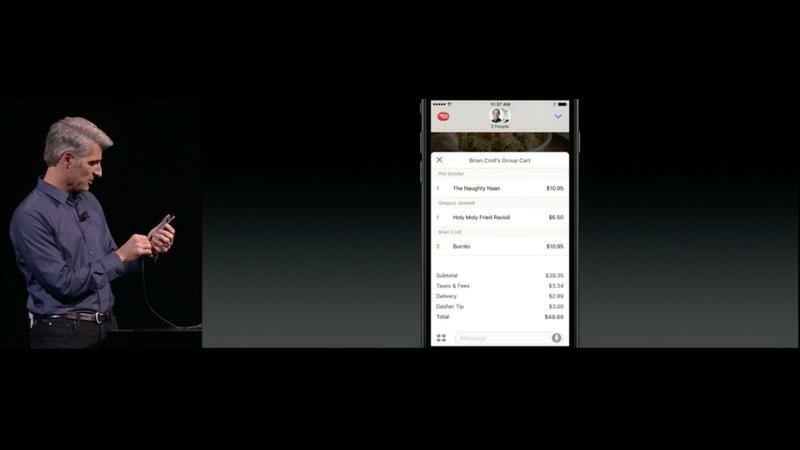 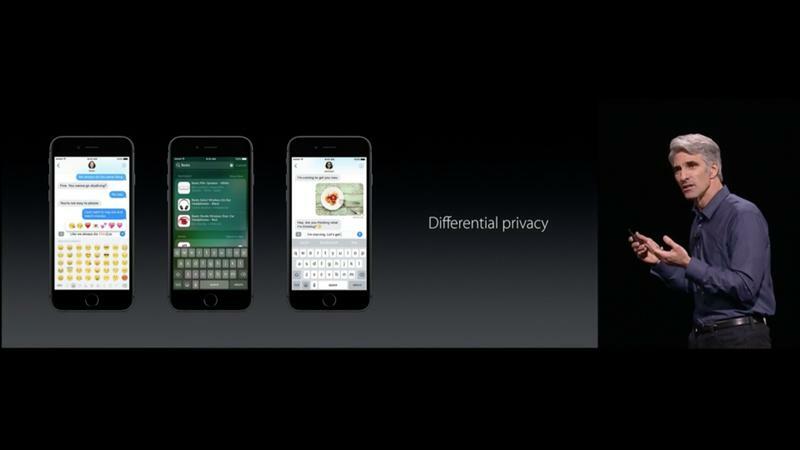 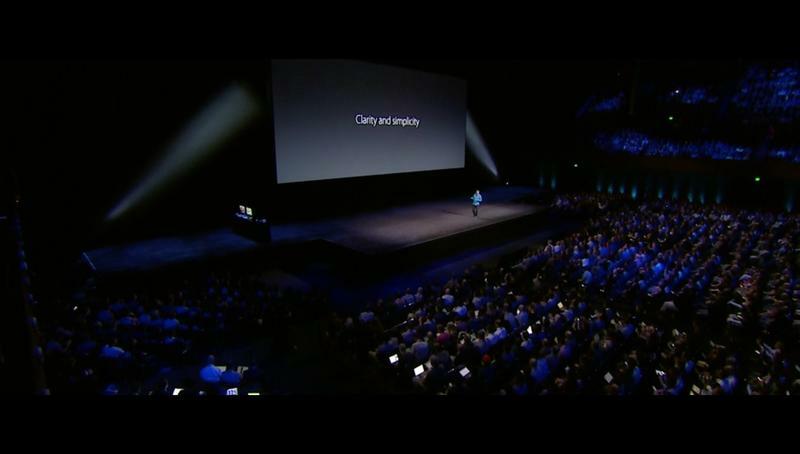 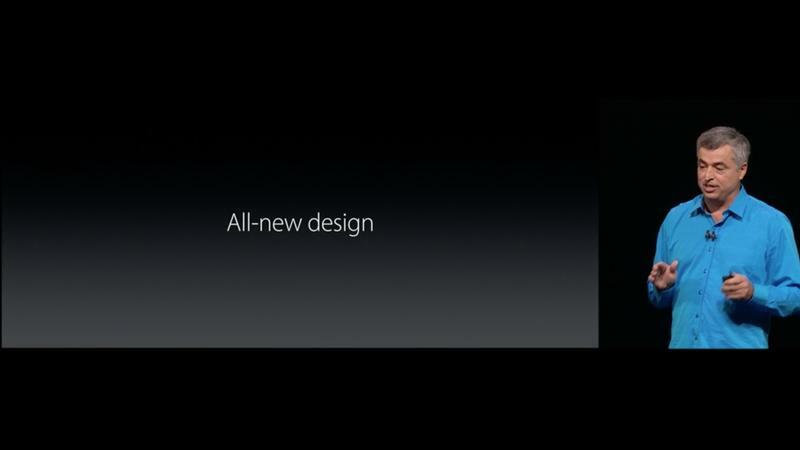 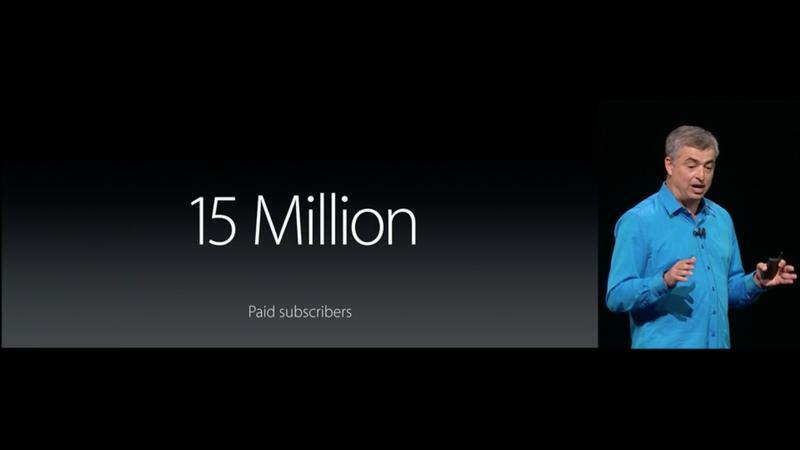 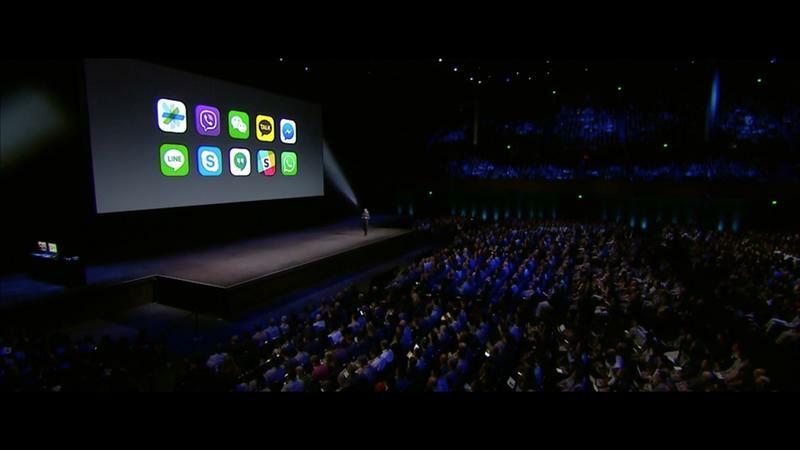 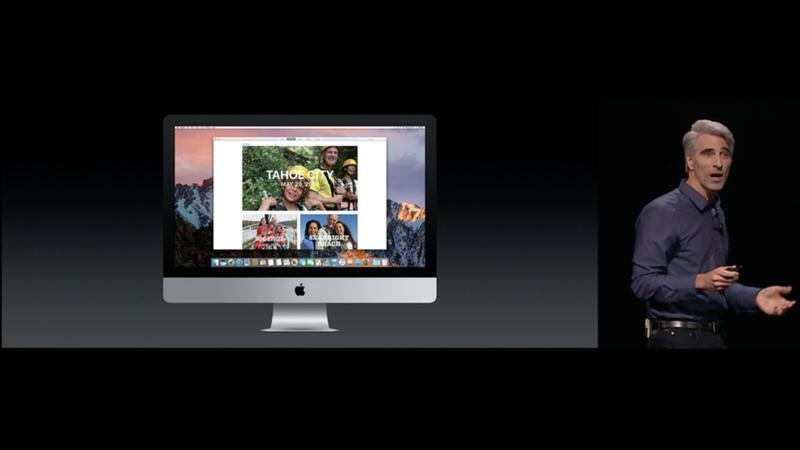 Apple also said that all of this doesn’t come at the expense of user privacy. 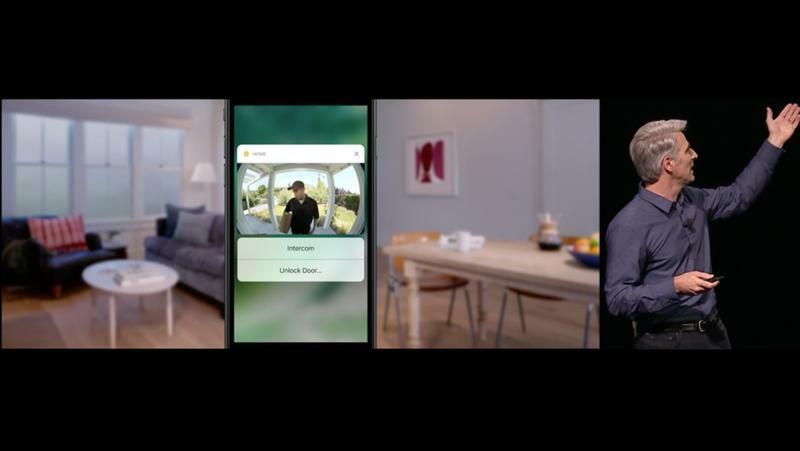 “In every feature we do, we carefully consider how to protect your privacy,” Apple said, noting that end-to-end encryption is enabled by default. 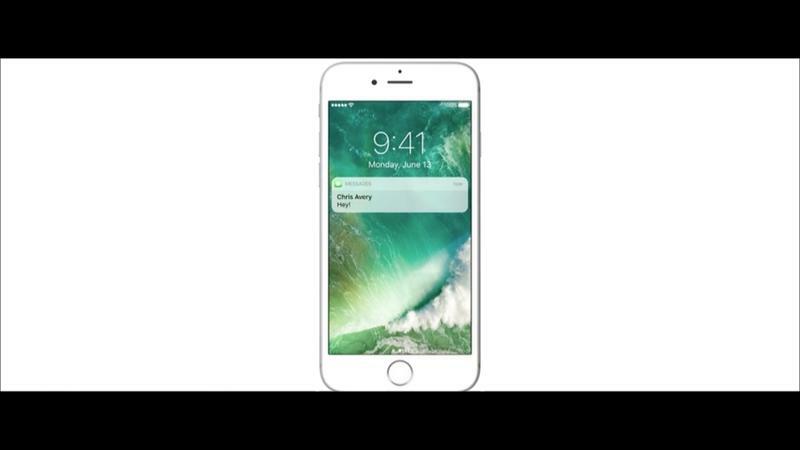 The iOS 10 developer preview launches today, the public beta hits in July and iOS 10 will launch this fall likely with the new iPhone 7.